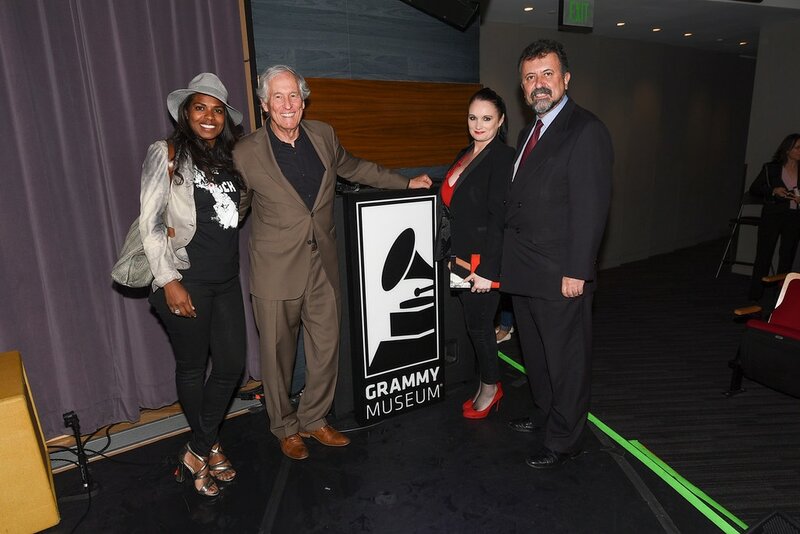 On April 28th, the Grammy Museum of Los Angeles Premiered FREE TO ROCK at their Clive Davis Theatre. 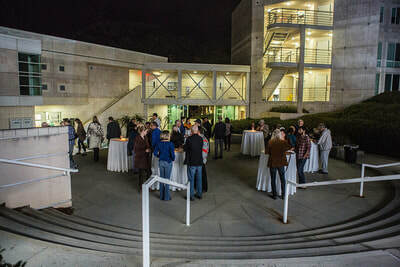 The pre-screening reception was filled with the leading figures of the city's entertainment, corporate, political and academic arenas, along with young, hip millennials and the senior baby boomers who lived through the nuclear fear of the Cold War. 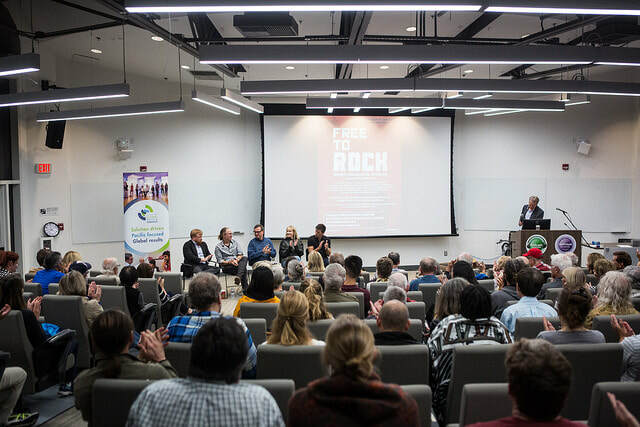 FREE TO ROCK screening to a packed Armstrong Hall at Colorado College on December 12th, 2018. Colorado College Alum, and producer of the film Nick Binkley, led a 45 minute discussion of the film and its thesis with the audience in the auditorium. 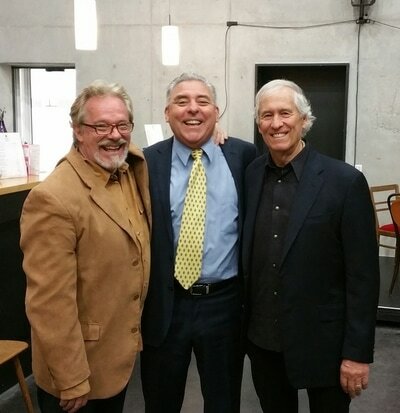 Rick Lemker, Jim Tarbell and Free to Rock producer Doug Yeager, at the screening. Rick was sound engineer for concerts that Doug promoted in Cincinnati in the early 1970s. On November 30, 2018, our producer Doug Yeager returned to his hometown of Cincinnati, to screen FREE TO ROCK at his Alma Mater, the University of Cincinnati, where he had majored in International Relations. 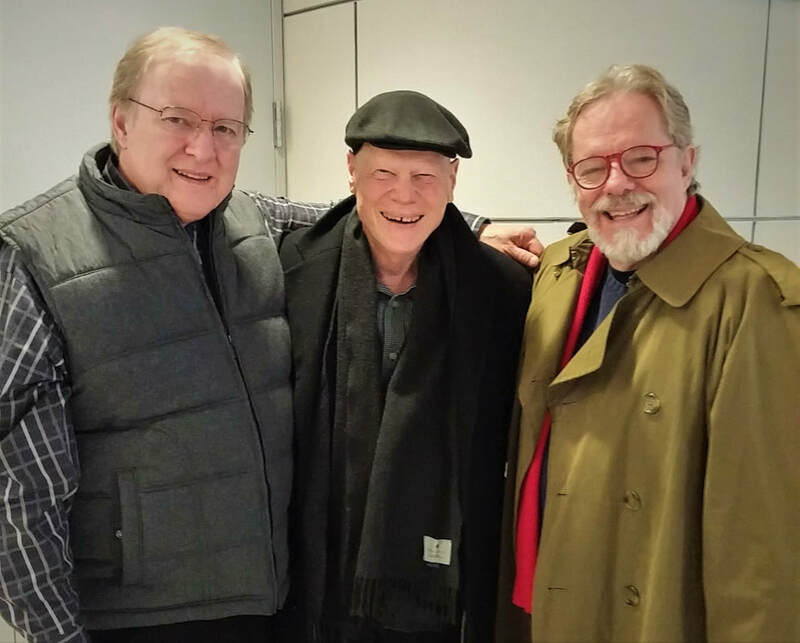 In the late 1960s and early 1970s he had also been a popular Cincinnati concert promoter and producer at his venue Reflections, before moving to New York in 1972. 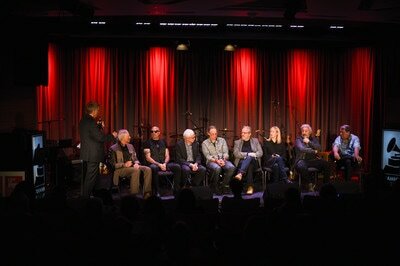 Among the concert artists he (and his partners Daniel Wolfe and Ken Kornell) promoted at Reflections, included: Allman Brothers Band, James Gang, Genesis, Yes, Aerosmith, Chuck Berry, Eagles, Boz Scaggs, Edgar Winter, Velvet Underground, Bonnie Raitt, Little Feat, Lynard Skynard, Doobie Brothers, Freddie Meyer, Cheech and Chong, Les Variations, and Long John Baldry. It was serendipity that two old friends from Doug's Cincinnati days, Joe Shea and Denny Janson, introduced FREE TO ROCK to professors Jeffrey Blevins and Andres Perez-Simone at the University of Cincinnati, who then co-sponsored the event with them at the university's Mainstreet Cinema in the schools Tangeman Center. 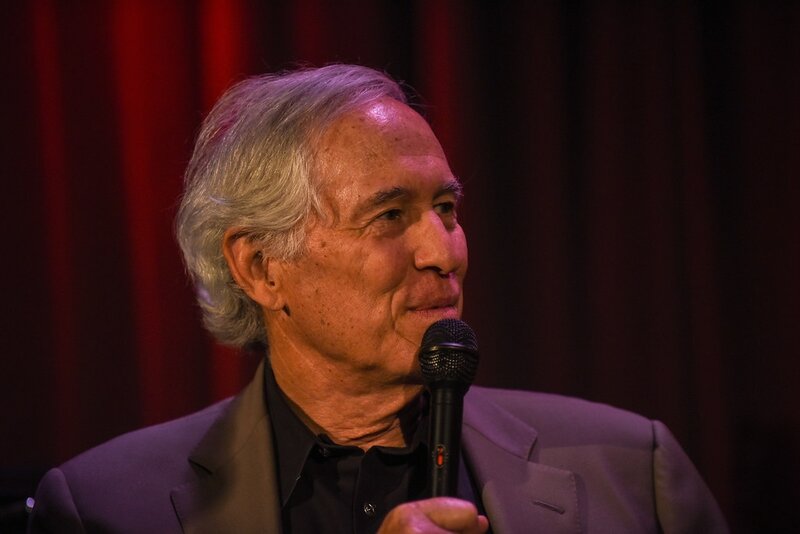 Many people who Doug hadn't seen in almost fifty years came out for the event, including those that worked at Reflections and at the radio station WEBN, along with his friendly competitor promoter at the time Jim Tarbell, whose venue Ludlow Garage was a favorite of acts around the country. Jim later was responsible for rehabbing downtown Cincinnati into a popular tourist attraction, before becoming Vice-Mayor of Cincinnati. U.S. 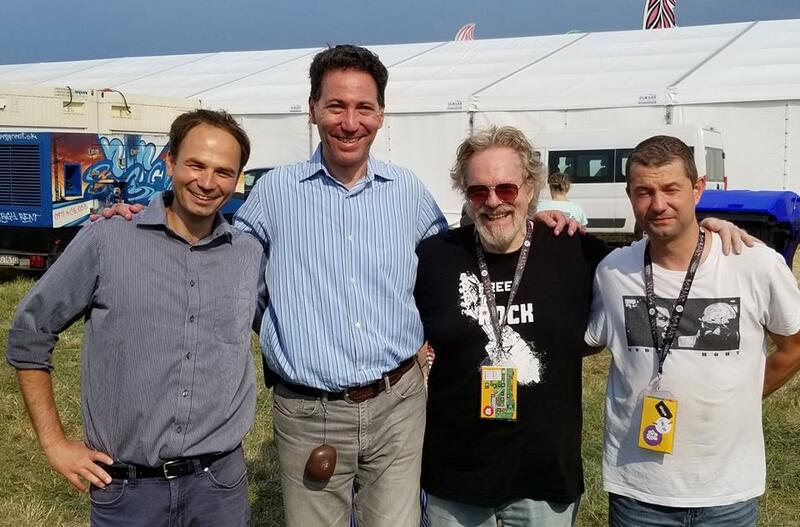 Ambassador Adam Sterling introduced FREE TO ROCK in the TYZDEN Tent at the Pohoda Festival, one of Europe's most popular and prestigious annual music and culture festivals. 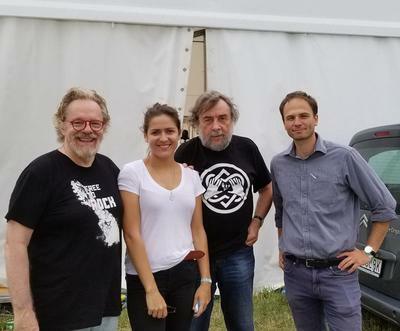 TYZDEN is Slovakia's politically progressive national weekly magazine, which acts as the people's political watchdog in exposing abuses of the current right wing government. 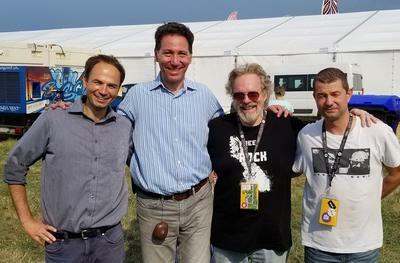 TYZDEN and the U.S. Embassy are co-sponsoring FREE TO ROCK at the Pohoda Festival.. The 200 seat tent was packed with a standing room only audience for the screening of FREE TO ROCK. Following the screening, the audience stayed in their seats as Lukas Fila, publisher of the nation's politically progressive daily newspaper DENNIK N (which interviewed our producer Doug Yeager last week), moderated a scintilatting panel discussion "How Music Can Transform Society and Lead to Freedom". The panel included Doug Yeager, along with Ladislav Snopko (former Slovakian Minister of Culture, who had been an underground rock promoter during the totalitarian communist era), and Pavol Remias (popular Slovakian rapper, who specializes in songs of social protezt). 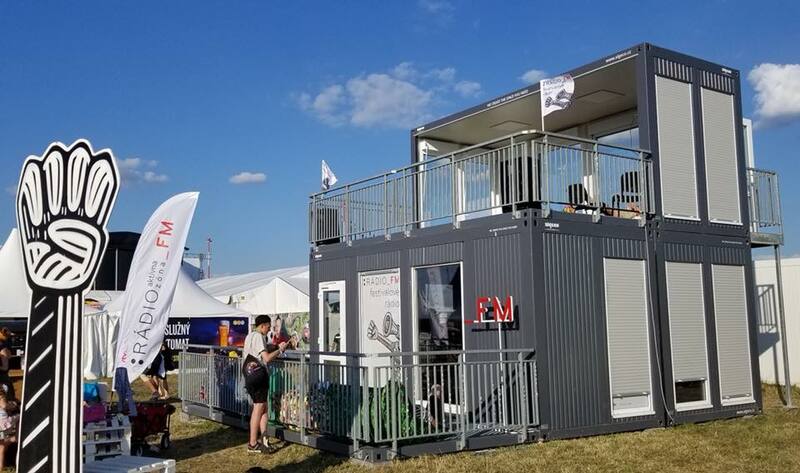 FREE TO ROCK's Producer Doug Yeager gave an interview for Slovakia's premier national rock radio station, RADIO FM, which has created a portable studio at the festival. For 30 minutes, Doug discussed FREE TO ROCK and the history of rock music's long battle against the communist security forces behind the Iron Curtain during the Cold War with RADIO FM's Martin Stano and his colleagues Dominika and Vera. 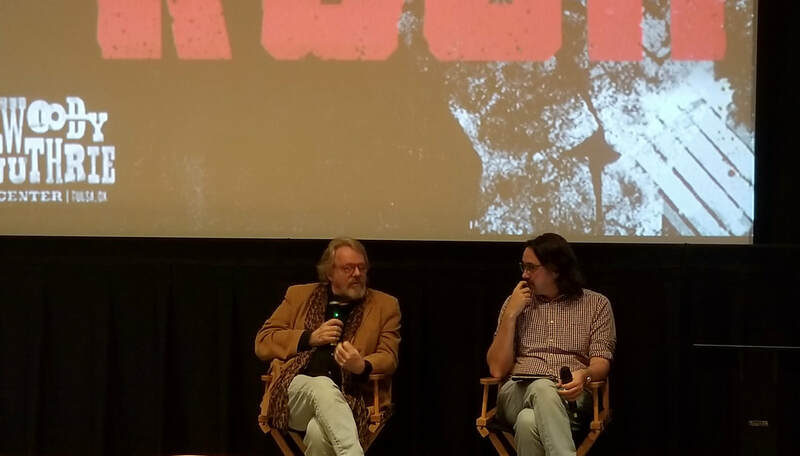 DISCUSSION/Q&A: Our producer Doug Yeager joined Griffin Rozell in leading a discussion and conversation with the audience while fielding a dozen insightful questions. We want to thank the U.S. Embassy and Ambassador Adam Sterling, Public Affairs Officer Griffin Rozell, Cultural Specialist Natalia Pindrochova who was our point person and brilliantly facilitated all of Doug Yeager's needs in Slovakia, in addition to the efficient and friendly team of administrators at the embassy. 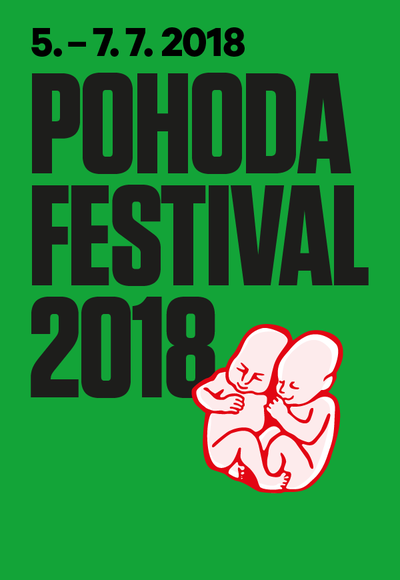 We also want to thank Tyzden Magazine, who co-sponsored with the embassy our screening and panel discussion at the fabulous Pohoda Festival, which promotes an admirable positive social and political agenda, which promotes the human rights of the nation's citizenry. 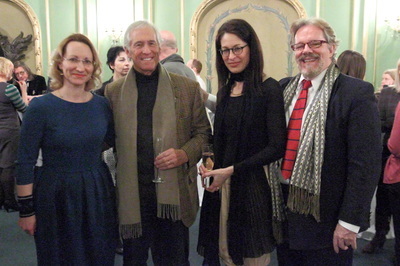 Kino Lumiere Manager Diane Kacerjakova, Griffin Rozell, Doug Yeager, Natalia Pindrochova, and Mica from the embassy. 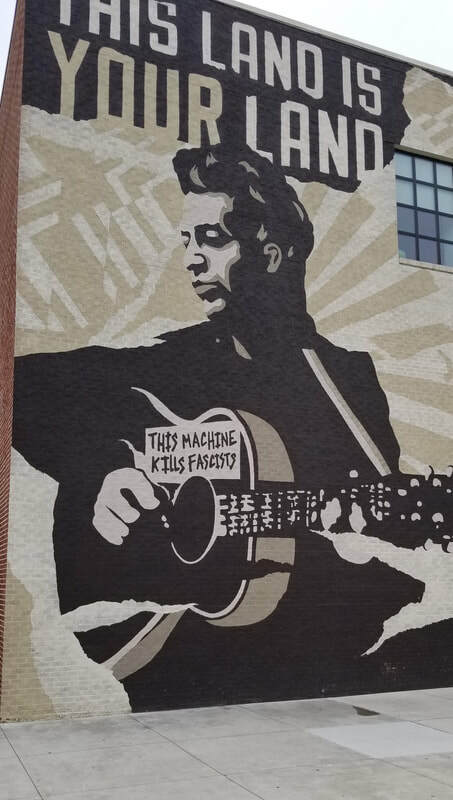 TULSA WELCOMED "FREE TO ROCK" WITH OPEN ARMS! THANK YOU to my dear friends Deana Stafford McCloud and the Woody Guthrie Center, along with Clark Wiens of Circle Cinema and the Tulsa Film, Music, Arts & Culture Commission for making this week's presentation and my trip to Tulsa possible. After the screening of the film, I enjoyed my discussion with Jerry Wofford, Educational Director of the Woody Guthrie Center and the Q&A with the audience. 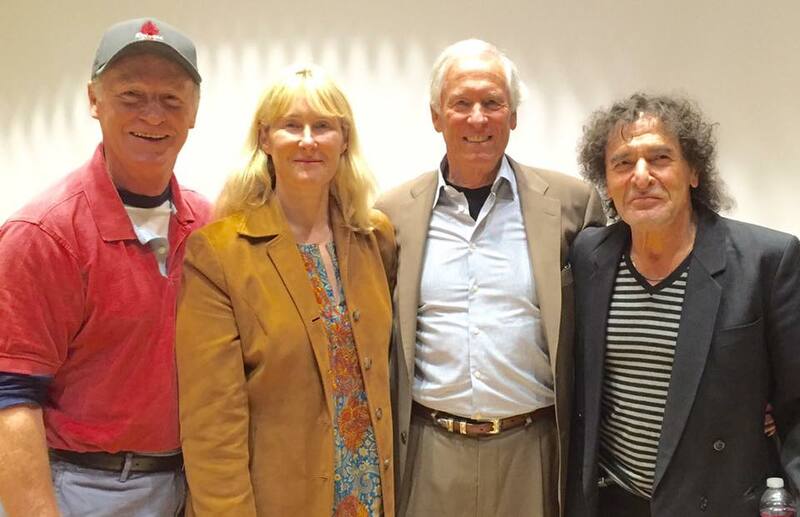 I think our story of how the power of music effected significant societal change behind the Iron Curtain during the Cold War would have made Woody smile. 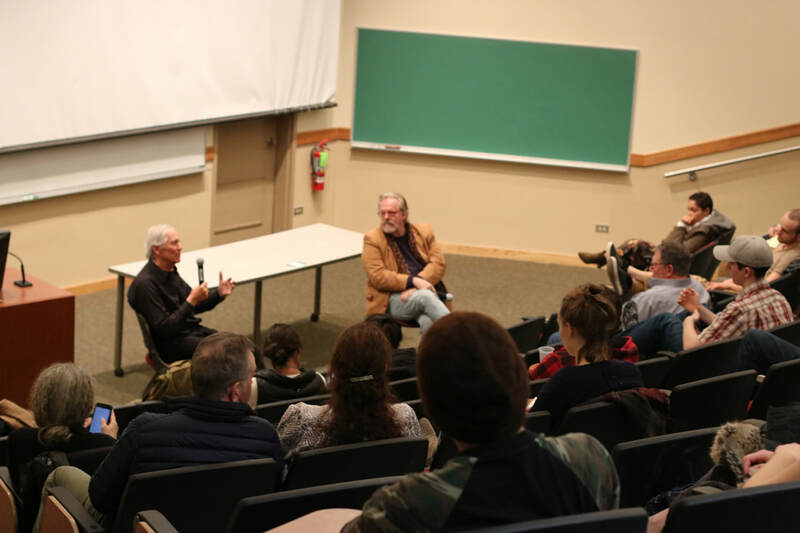 Producers Nick Binkley and Doug Yeager screened FREE TO ROCK at Skidmore College's Davis Auditorium on Wednesday the 21st. 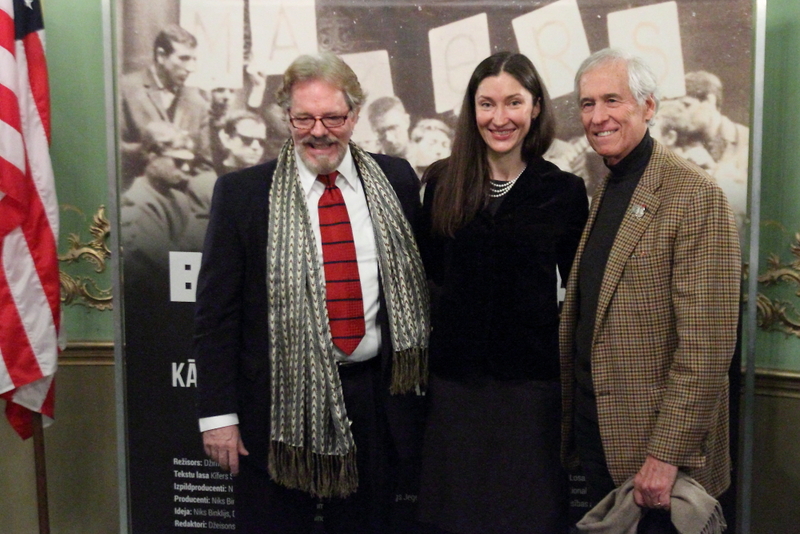 The screening played to a full house of students and many from the `60s Cold War generation, including former Mayor Kenneth Klotz of Saratoga Springs, former Mayor John Sullivan from Oswego, and Saratoga Springs' community organizer and former NFL running back Bob Reed. 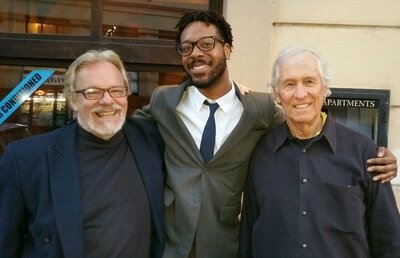 After the screening Nick and Doug held an inspiring Q&A with the audience for 40 minutes. 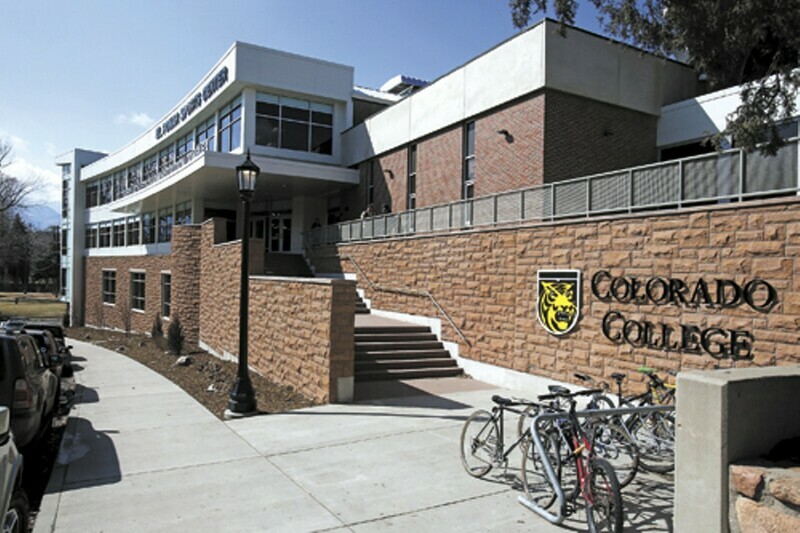 While at Skidmore on Wednesday and Thursday, Nick and Doug also participated in classroom discussions with Professor Vickie Riley's Story to Screen class; Professor Jordana Dym's Principals of Documentary class; Professor Anthony Holland's Scoring for Film class; Professor Mark Woodworth's Documenting the Makers class; and Professor Scott Mulligan's Law and Ethics for Media's class. Thank you to all the professors and their students, and a special thanks to Professor Jordana Dym for coordinating and producing our events at Skidmore, and to Skidmore grad Zoelle Cacia whose idea it was for Skidmore to present the FREE TO ROCK events. FREE TO ROCK Producer Doug Yeager took a seven city (8 program) tour of eastern Germany produced and sponsored by the U.S. Embassy in Berlin and its consulates in Leipzig and Hamburg. 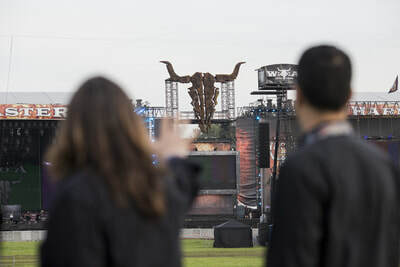 The tour was co-sponsored by the Schoepflin Stiftung Foundation and the Wacken Open Air Festival and Metal Summit (both of Germany). 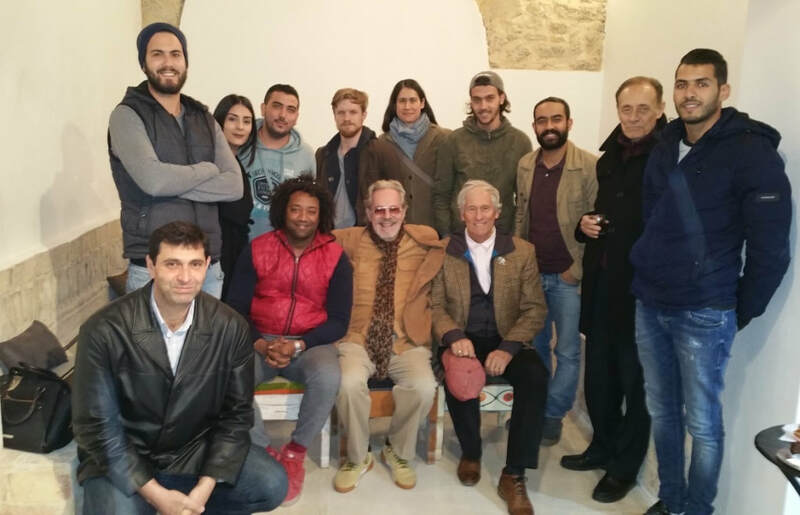 At each program an embassy or consulate officer welcomed the audience. 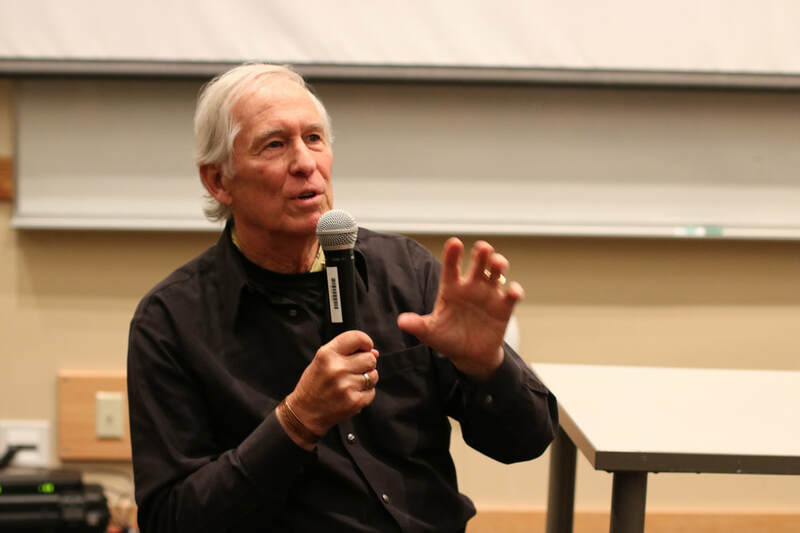 The screenings of the film were followed by a discussion and Q&A with the audience by Doug Yeager. On several of the programs, Doug was joined by professors, historians and diplomats for the discussions. 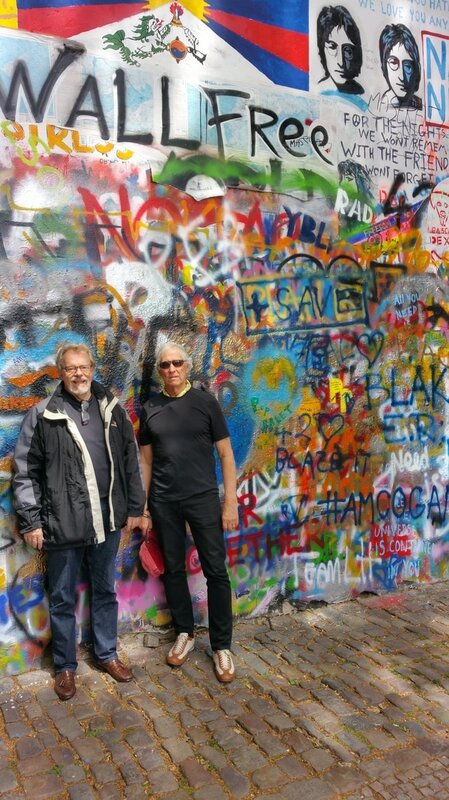 We made many friends on this trip through Germany, with memories that will always be with us. 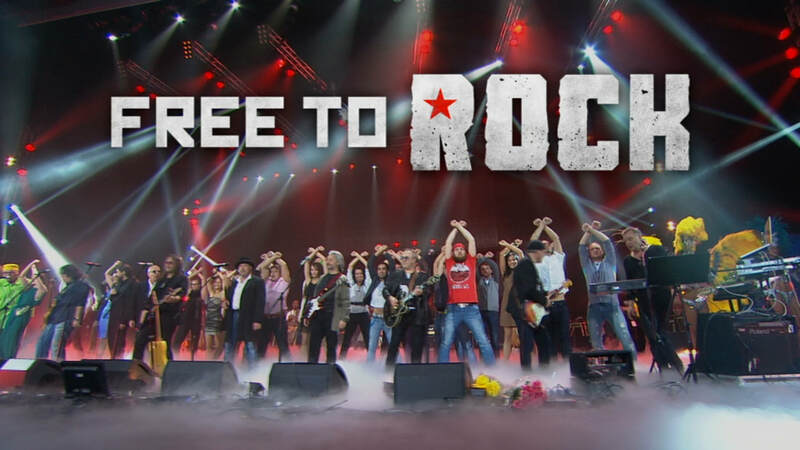 ​During our German tour, FREE TO ROCK began its national airing in Germany (and France) on ARTE Television, and the DVD (plus the Bonus disc on the making of the film) was released on Amazon Germany. Special Thank Yous go out to America's acting ambassador to Germany, Charge d'Affairs Kent Logsdon, to the embassy's Cultural Attache, Michelle Logsdon, to the Consul Generals Rick Yoneoka and Tim Eydelnant,to the Cultural Specialists Kerstin Reichert, Anika Kreller and Susan Wiedemann, and to Laura Hammond, Consul for Political and Economic Affairs, Hamburg. 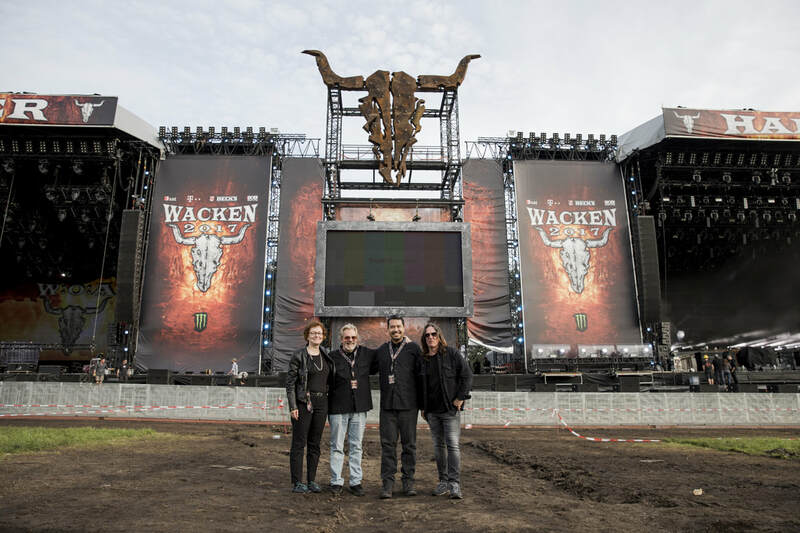 An additional Special Thank You to our co-sponsors, Hans Schoepflin, Tim Goebel and Lukas Harlan of the Schoepflin Stiftung, and to Thomas Jensen and Tim Hoffmann of the Wacken Open Air Festival and Metal Summit. Your time, effort and hands of friendship offered was deeply appreciated, and will never be forgotten. Free to Rock screened before a fascinated audience of 200 Leipzigians in the Bibliotecha Albertina at the historic Leipzig University Library in Germany. 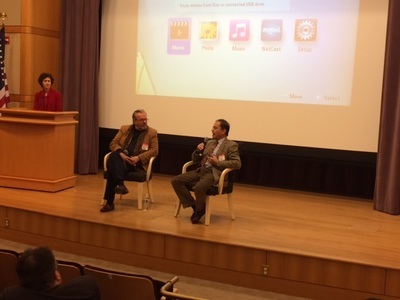 U.S. Consul General Tim Eydelnant opened the evening's program with welcoming remarks, and then joined Doug and professor Sebastian Herrmann of the University's American Studies Department after the screening for a discussion of the film's cultural soft power message, moderated by journalist and cultural specialist Anika Kreller. 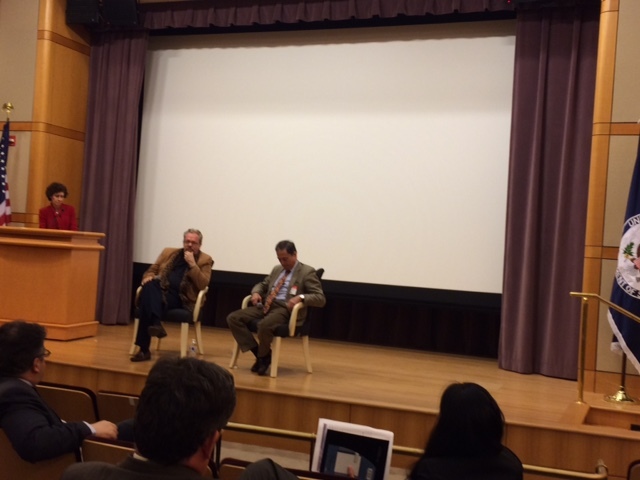 Virtually the entire audience stayed for the one hour discussion and Q&A in which they enthusiastically participated. The lively group was made up of an interesting mixture of students, townsfolk, some transplanted Americans, and an adorable 77 year old couple, originally from West Berlin, who thanked Doug profusely for allowing them to relive their youth so vividly. 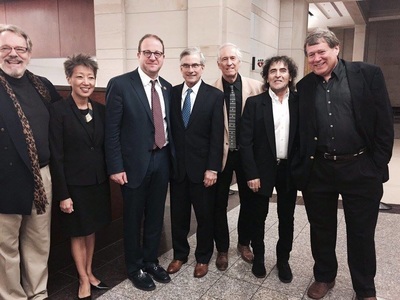 ​Consul General Tim Eydelnant, Doug Yeager, professor Sebastian Herrmann, and Anoka Kreller. Our Free to Rock program this evening was presented in the auditorium for the State of Saxony's Institute for Civic and Political Education. Anika Kreller, Cultural Affairs Specialist for the consulate, welcomed the audience. 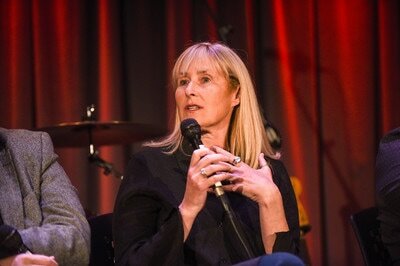 Our host and moderator of the post-screening discussion and Q&A was Sabine Kirst, the Political Director of the Institute. Joining us in the discussion was Professor Katja Kanzler, Chair of the American Studies Department at the Technical University of Dresden. We had a fascinating discussion on the film's soft power thesis, and the power of music and culture to challenge authoritarian regimes and effect changes in those societies, and how it is still effectively being applied today. 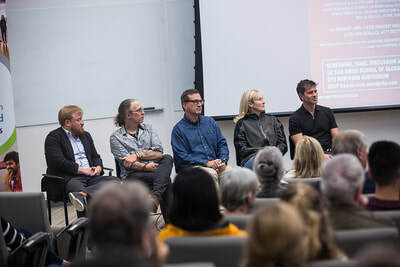 The audience involved in the Q&A included high school teachers of American History, who noted that they plan to purchase the FREE TO ROCK DVD from German Amazon and show it and discuss it in their classrooms. 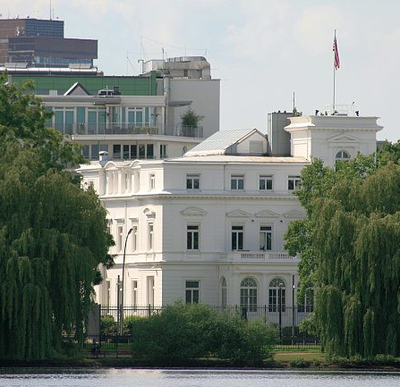 The Free to Rock embassy tour arrived at the Konrad Wolf Film University in Potsdam, Germany, the legendary home of German cinema where Marlene Dietrich and Fritz Lang first achieved fame. 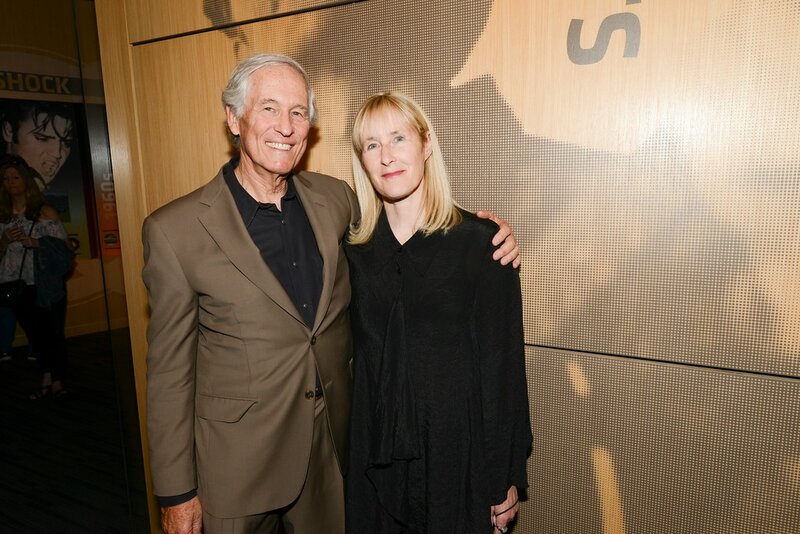 Our host Julie Diebel, Press Spokesperson for the university, brought us to their new film screening room with great visuals and sound reproduction. 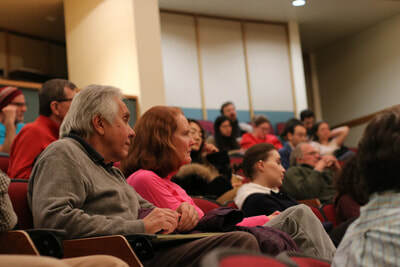 Michelle Logsdon, Cultural Affairs Attache of the embassy, gave the welcoming remarks to the audience of film students and American Studies students. 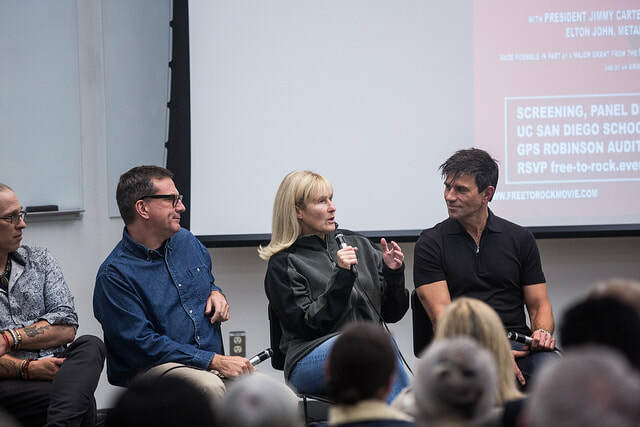 After the screening, Michelle and FREE TO ROCK producer Doug Yeager, along with Peter Clausen, the retired Cultural Affairs Attache of the embassy, had a wonderful discussion and Q&A with the students. Both Michelle and Peter had been stationed to the U.S. Embassy in East Berlin in 1987-1988, and related fascinating stories of those years, including attending the Genesis and Pink Floyd concerts at the Wall, where the PA speakers were aimed at the rock-starved youth in East Berlin. 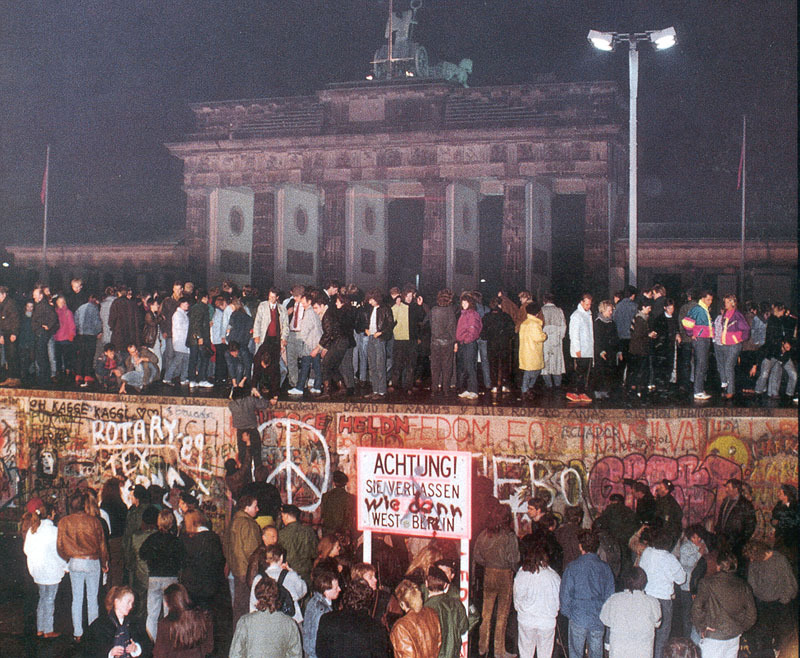 Most of the student's parents had lived under the East German communist regime and had told them stories of living under that system, and of the importance rock music from the West meant to them. A special morning. Free to Rock was screened at one of Berlin's prestige cinema houses, the Zoopalast, before a full house of students from Freie University, Humboldt University, and two high schools. 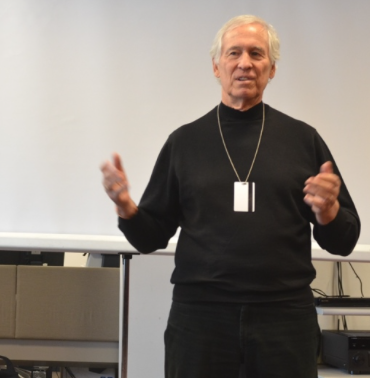 Kent Logsdon, the Charges d'Affairs of the U.S. Embassy in Germany (the acting Ambassador) welcomed the students with an inspiring speech on the importance of Cultural Diplomacy. 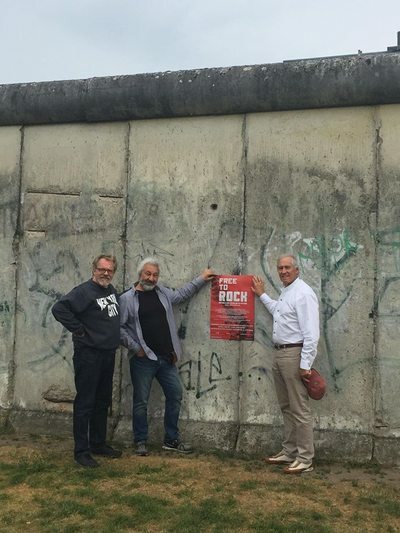 Our Free to Rock screening and discussion tour of Germany with producer Doug Yeager, U.S. Consul General Rick Yoneoka and Cultural Affairs officer Dr. Susanne Wiedemann reached the 900 year old city of Neubrandenburg in northern Germany. 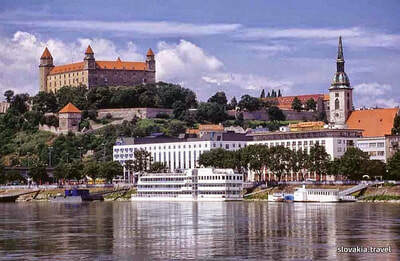 The historic high walled old city, that had been set on fire by the Soviets when they took control of eastern Germany, has been rebuilt since the reunification of Germany and is not only a beautiful reminder of German life centuries ago, but also a symbol of a peoples who were determined to rebuild their history after an invading force tried to obliterate it. Waiting for us at the theatre were local residents, college students, and a contingent of advanced high school students who had driven 20 miles for the event because U.S. Consul General Yoneoka had given an inspirational speech at their school last year. Consul General Yoneoka welcomed the audience with another inspirational speech about the importance of Cultural Diplomacy. Then, following the screening, we enjoyed our longest discussion and Q&A session of the tour. The parents and grandparents of everyone in the audience had lived under the hammer of the communist regime. And, they had told the students stories of the suffocating life they endured in East Germany...But also of the liberating feelings they experienced when catching the Rock & Roll 'sounds of freedom' coming from the West that they would hear late at night on their short wave radios as the hid up in their attics. For 90 minutes we had a fascinating conversation about life in East Germany under communist rule, about life in America, and about the power of rock music to liberate people's souls who live living under oppressive totalitarian rule. ​Panel: Doug Yeager was joined by Laura Hammond, Susanne Wiedemann, the consulate's cultural officer, Tim Hoffman of the Wacken Open Air Festival and Professor Kothe. Our Free to Rock tour rolled into the twelve hundred year old port city of Rostock on the Baltic Sea. 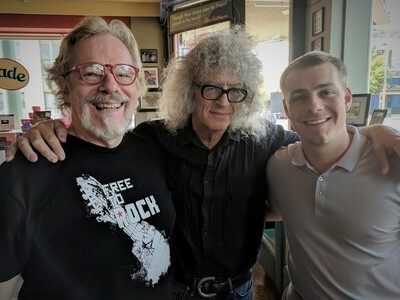 Professors Benjamin Kothe and Fabian Bade of the Unversty of Rostock School of Music and Drama, Popular Music Department greeted us upon our arrival and took us to a wonderful German restaurant. Laura Hammond, Political and Economic Officer of the U.S. Consulate Hamburg, welcomed the audience in the college's beautiful theatre. Interestingly. This was the first experience during the tour of presenting the film and holding a discussion with a room full of music students. The panel discussion was a fascinating discussion with the students who obviously asked many questions pertaining to the power of music, the music of the Cold War era, and how it is still being implemented around the world. 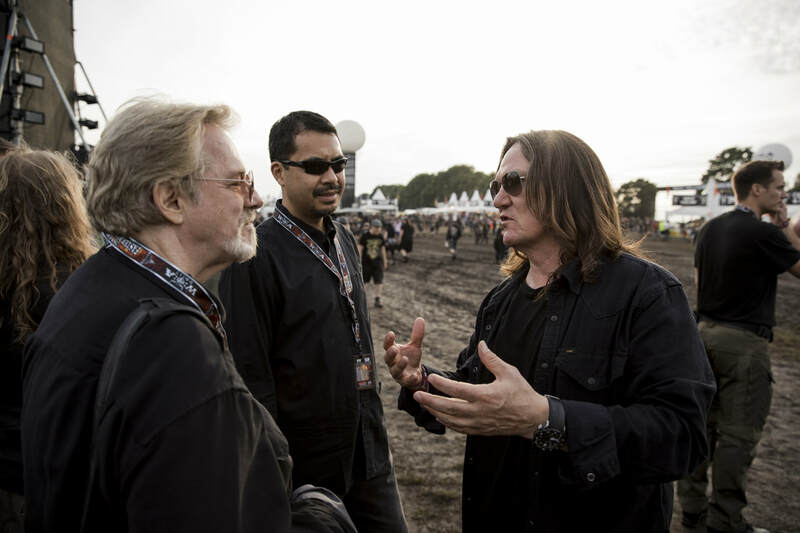 On November 23rd, our producer Doug Yeager and the Free To Rock train made its final stop of the year in Germany, pulling into the beautiful 900 year old city of Greifswald, on the coast of the Baltic Sea, just fifty miles from the Polish border. For centuries, the control of Greifswald, a vital shipping port, went back and forth from the Danish to the Pomeranians, then from the Prussians to the Swedes, and finally to the new nation of Germany when all of its states unified in 1871. In April 1945, during WWII, as Nazi Germany was collapsing, Greifswald prevented destruction of the historic city by surrendering to the invading Soviet armies, and was later held under communist control in the German Democratic Republic, known as East Germany, until 1990. Laura Hammond, U.S. Consul for Political and Economic Affairs, once again greeted our audience. 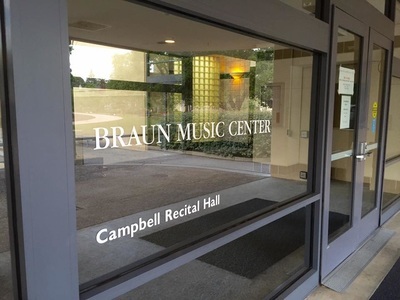 She told them the story of first coming to Germany as an exchange student at the age of 17 -- not speaking a word of Germany, but learning the language through German pop recordings, while her German `sister' learned English through American recordings. 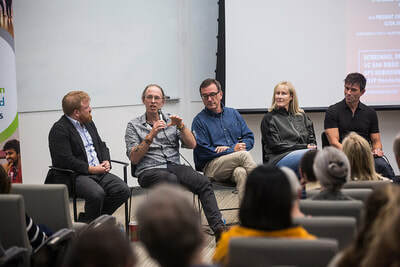 After the screening, Doug Yeager had a fascinating discussion with the university's American Studies professor Dr. Sebastian Domash, along with Laura Hammond, the U.S. Consulate's Cultural Specialist Susanne Wiedemann, our old friend Lukas Harlan, representing Schoepflin Stiftung, and ​the students of the university. 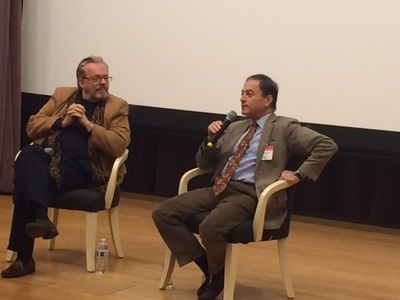 On November 3rd, a FREE TO ROCK screening and discussion session was held at the residence of U.S. Consul General Richard Yoneoka in Hamburg, Germany. Last Spring, Consul General Yoneoka established the “Consul General’s Youth Advisory Council” -- a new and unique initiative launched by an American Consul General in Germany. 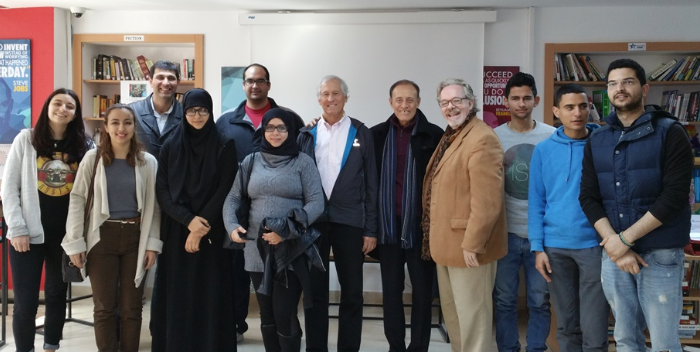 He meets once a month with a diverse group of fifteen high school students from all over Hamburg. 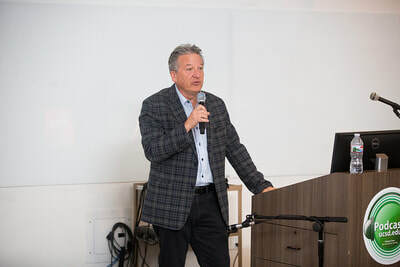 After speaking with over a thousand high school students throughout his consular district, the Consul General, felt it was important to establish and maintain a regular and open dialog with German youth to learn more about their visions and hopes related to German-American relations. 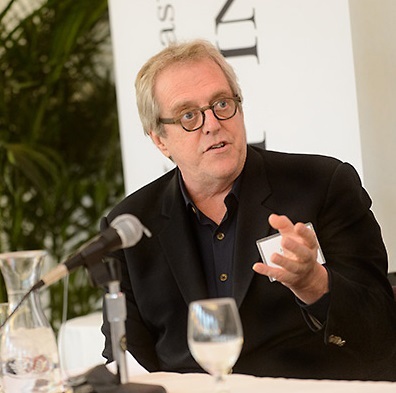 In addition to his interest, time, and open ear, he offers the participants a comprehensive program that showcases the breadth of American culture, society, and politics, and provides a glimpse of the many shapes and forms of German-American engagement. 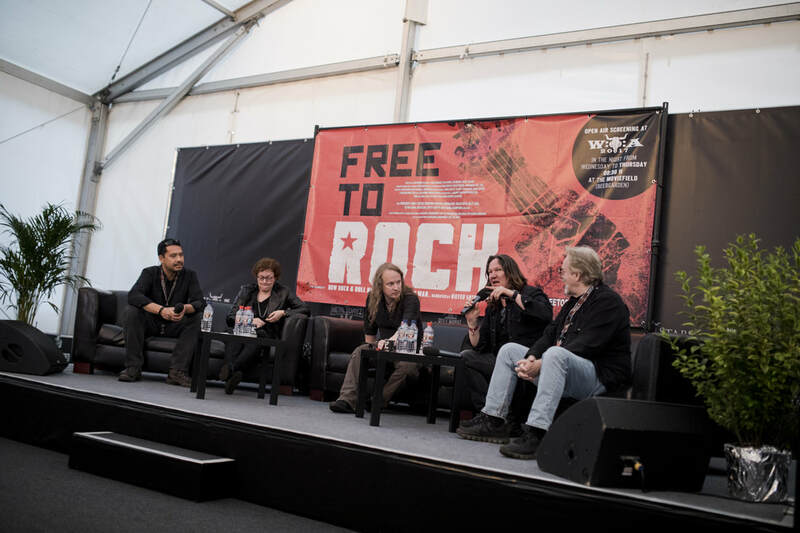 This August, Consul General Yoneoka joined FREE TO ROCK producer Doug Yeager at the Wacken Open Air Festival's screening of the film and participated in the press conference. 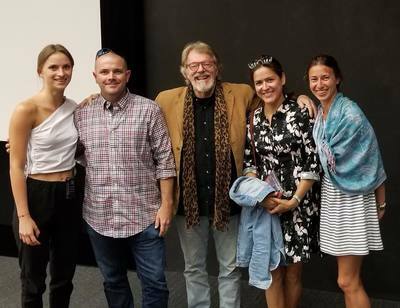 He found our film about the trans-formative power of music/culture very powerful, and wanted to share it with his Youth Advisory Council members, and discuss the film and its soft power of culture thesis. 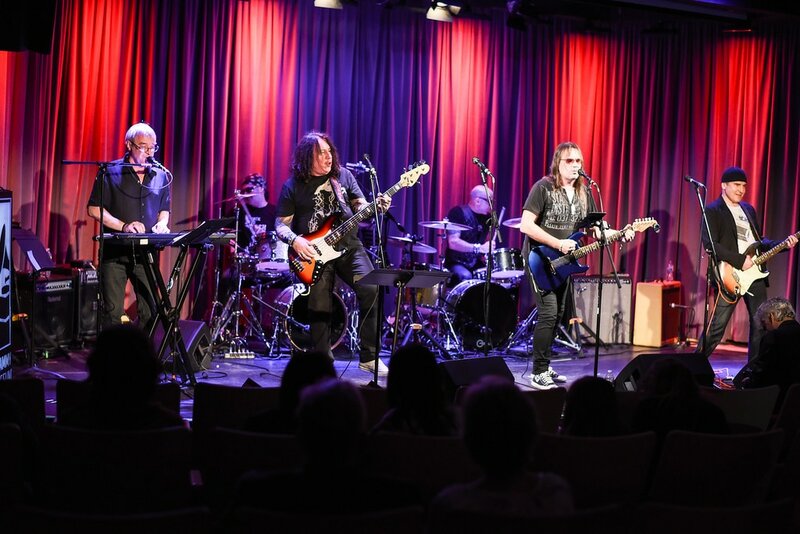 The report we just received from the Consul General, is that the session was most successful with the German youth leaders fascinated in learning and discussing history, current affairs and the power of music found in FREE TO ROCK. 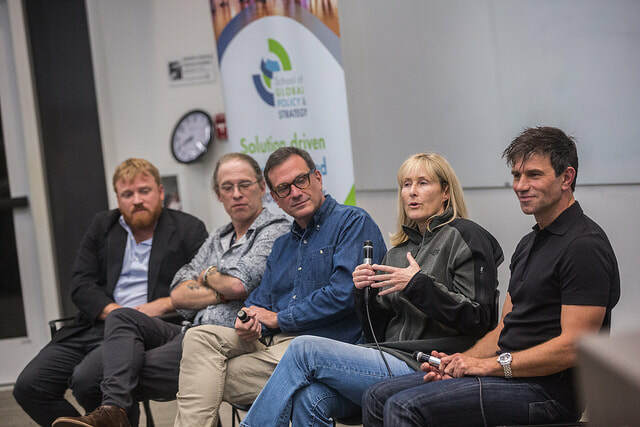 Free To Rock screened at UC San Diego School of Global Policy & Strategy screening November 1st at the Robinson Auditorium on the UCSD campus in La Jolla. It was a packed house with over 275 attendees and most stayed for the discussion after with panelists Mikheil Alexseev, Department of Political Science, San Diego State University, Jesse Driscoll, School of Global Policy and Strategy, UC San Diego, Mark LeVine, Department of History, UC Irvine, Patrick Patterson, Department of History, UC San Diego, Joanna Stingray, Singer-songwriter; interview subject in film and moderator Bradford Auerbach. ​"The (FREE TO ROCK) screening last night was a huge success. 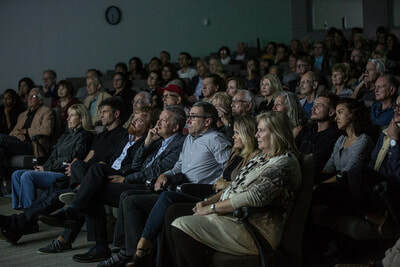 The audience was riveted by the film. 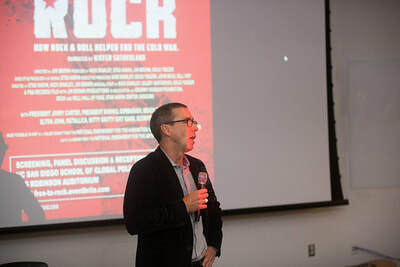 They were drawn in, entertained, provoked, and through the panel discussion shown the impact of soft power and its connection to events in the present day. It is rare that we get the opportunity to discuss an issue like soft power in a manner that is both relevant to events in the current day and downright fun. The panel discussion was a great success and left the audience clamoring for more. We appreciate you all making yourselves available for the San Diego screening of this very important film. It was a great showcase for GPS. Thanks on behalf of GPS and thanks to Nick for making last night possible." "I want to thank everyone. It's a great movie. I always learn so much. Hoping to bring it to UC Irvine soon!" 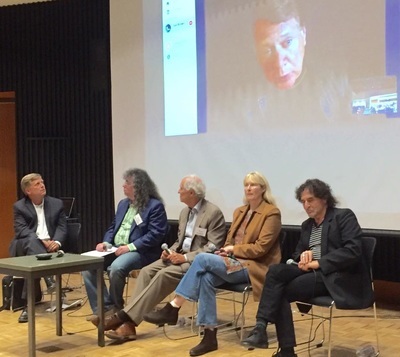 "Thanks to everyone for your participation on the panel last night. The feedback was constantly positive; your involvement was a critical part of a successful evening. Kudos to the GPS team for organizing all the moving parts. 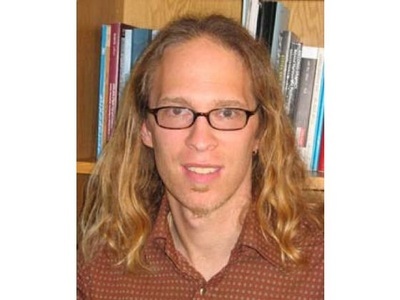 And thanks to Nick, without whom we would not have gathered in the first place." 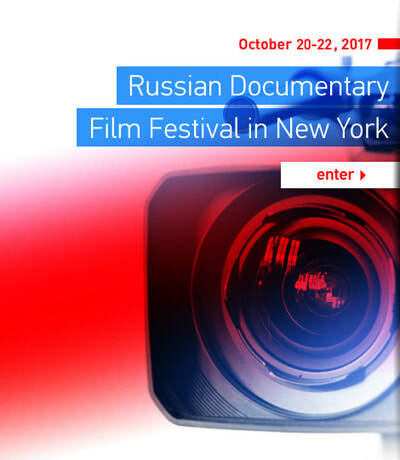 On October 22nd, FREE TO ROCK was screened at the Russian Documentary Film Festival in New York City before a full house from the Soviet and Russian Diaspora. 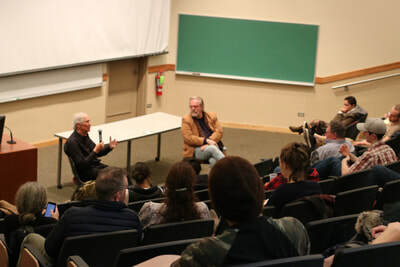 Immediately following the screening, producer Doug Yeager and Olga Lvov of the festival, led a lively and fascinating discussion and Q&A with the audience. 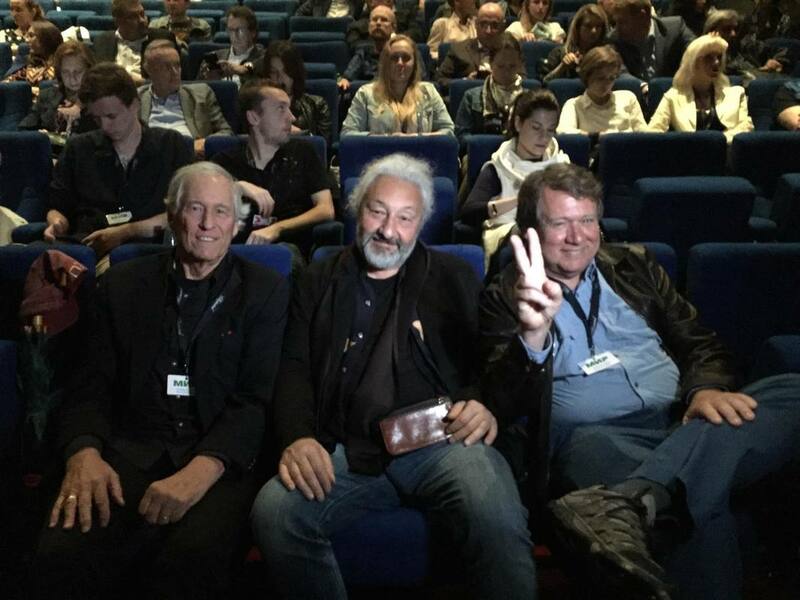 Everyone in the audience was familiar with the film's story line of how Rock & Roll confronted and combated the Kremlin during the Cold War, and they all were familiar with the Soviet rock stars featured in the film: Stas Namin, The Flowers, Viktor Tsoi and KINO, Andrey Makarevich and Time Machine, Yuri Shevchuk and DDT, Boris Grebenshikov and Aquarium, along with Joanna Stingray and Dean Reed. 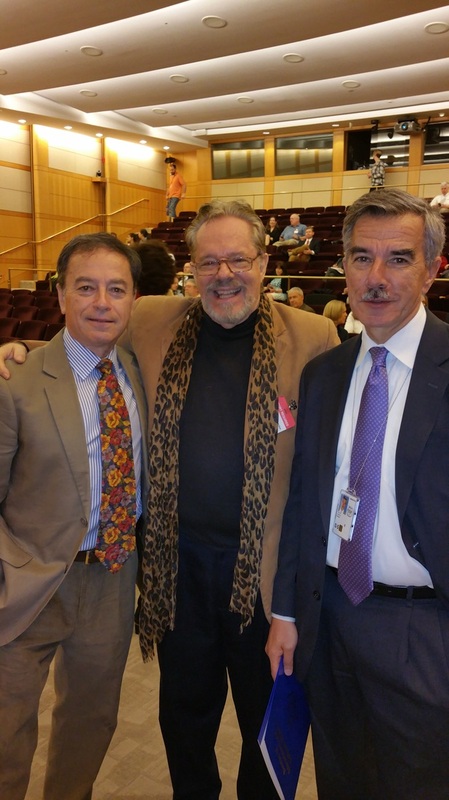 They all agreed that cultural diplomacy is the only solution for combating the authoritarian regimes today. 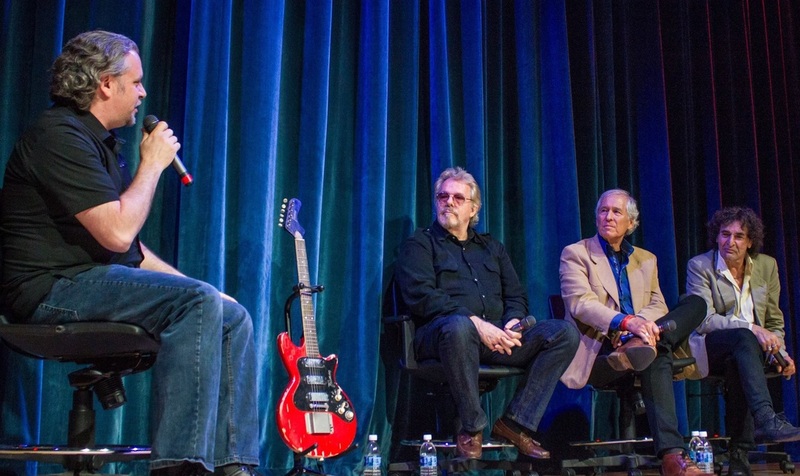 WONDERFUL "FREE TO ROCK" EVENT IN MEMPHIS ! 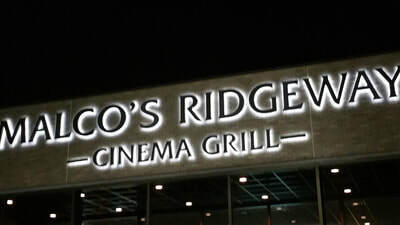 On September 27th, INDIE MEMPHIS (ranked as one of the ten best film festivals in the USA), screened FREE TO ROCK at the Malco Ridgeway Cinema Grill in Memphis, preceded by Robert Gordon's new short (20 minute) film A BOY FROM TUPELO, about Elvis Presley's early recording years in Memphis in 1953 and 1954. 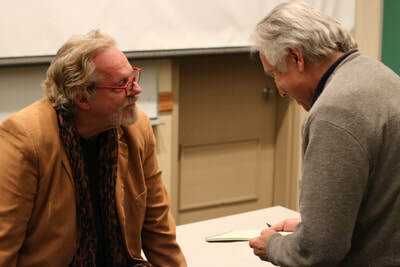 Prior to the showing of the films, Ryan Watt (Executive Director of Indie Memphis), Robert Gordon (who also penned books on Elvis, Jerry Lee Lewis, Muddy Waters, STAX, et al), and FREE TO ROCK producer Doug Yeager welcomed the audience and gave brief summaries of the films they were about to see. Doug really enjoyed A BOY FROM TUPELO, as it showed us those early years of Elvis's career, told by those people that worked with him, and thinks its a perfect short film to introduce FREE TO ROCK. 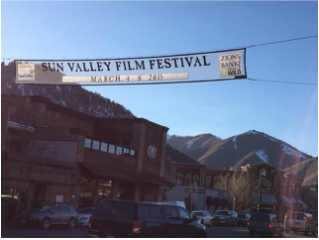 It was received warmly by the audience, many of whom were interview subjects in the film. FREE TO ROCK then was shown. 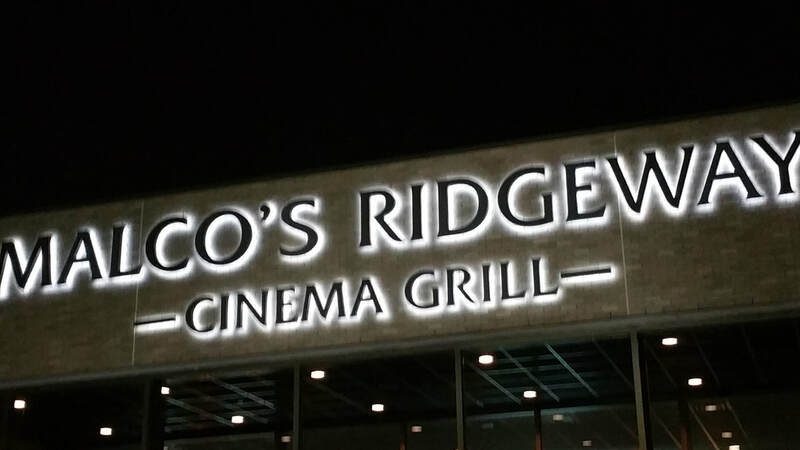 At its conclusion, I was thrilled to experience a long sustained applause from the theater audience. Happily, everyone stayed in their seats as we then spent 35 minutes in a fascinating discussion and Q&A with the audience. Among those asking questions were two of Elvis's teenage friends and musical contemporaries at Sun Studios, JM Van Eaten and James Cannons, plus Dr. Susan Murrmann, a board member of Indie Memphis, who as a child lived in communist Poland. She was very moved by the film. 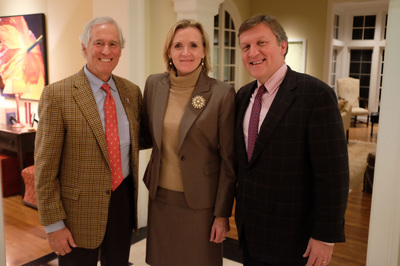 Thanks to my dear friends and the evening's Sponsors: Memphis's most respected music attorney Bruce Newman, and his equally impressive wife Barbara Ballin Newman (President of the Blues Foundation). 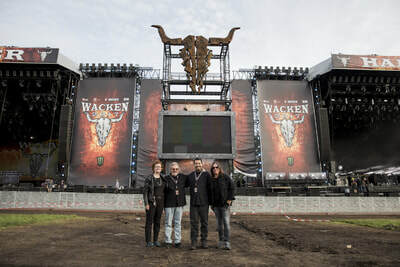 The Wacken Open Air Festival hosted a FREE TO ROCK Press Conference, followed by a presentation of the film on a large outdoor screen to its audience on August 2nd, 2017. This Festival, now in its 28th year, is the largest heavy metal music festival in Europe, with 80,000 fans camped out annually for the four day event with 155 metal bands from all over the world. The 8:30 pm Press Conference with highly engaged press members and the festival audience, was moderated by noted German music journalist Christof Leim, with panalists: Doug Yeager (producer of the film), Thomas Jenson (Co-founder of Wacken Open Air Festival), Richard Yoneoka (Consulate General of U.S. Embassy/Germany), and Birgit Degenhardt (Artistic Director of Schoepflin Foundation). The Moscow International Film Festival is one of the oldest in the world. 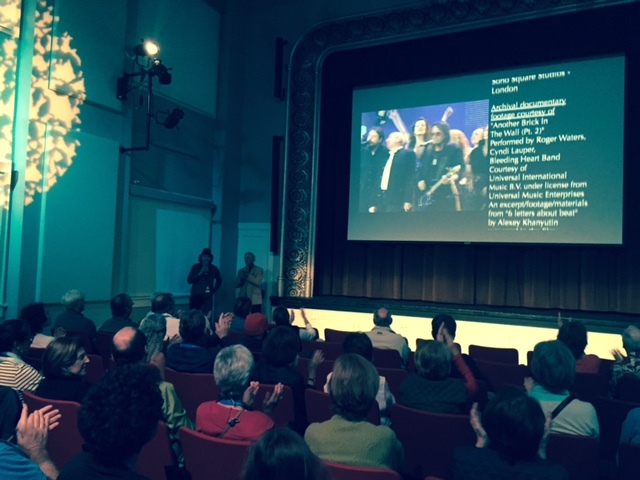 For the first time it was held in 1935 with Sergei Eisenstein as chairman of the Jury. 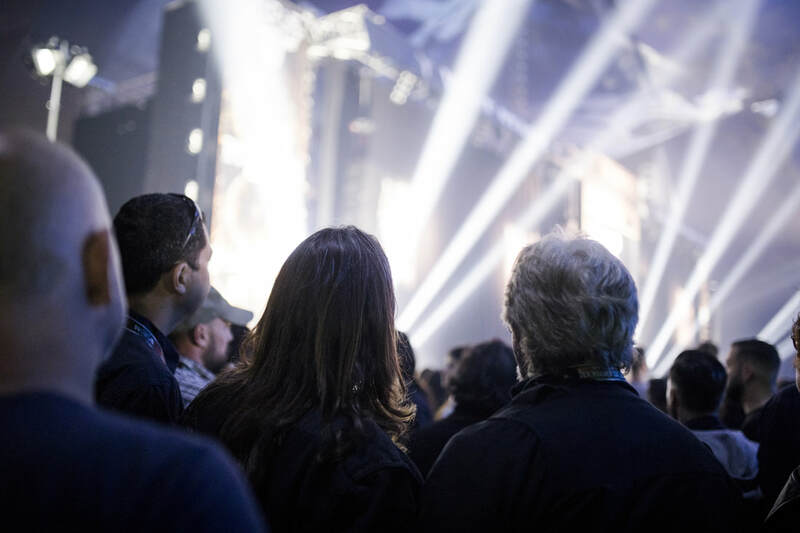 Nevertheless the Festival history is usually traced back to 1959, when it became a regular event. 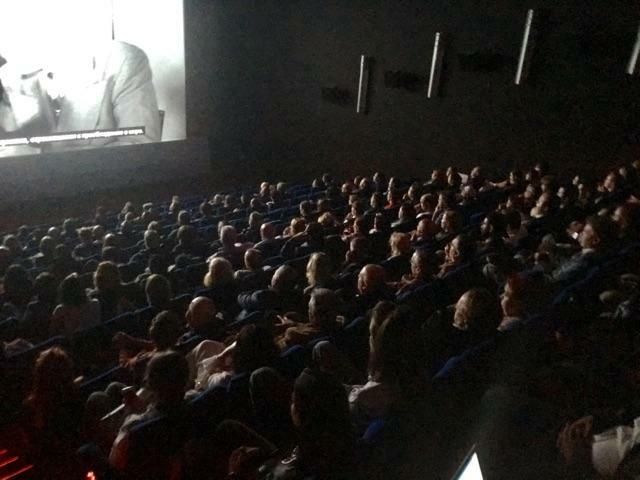 It is noteworthy that the Festival was reborn in the 1960s during the so called “period of thaw”, when film industry experienced an influx of filmmakers of a new generation whose spiritual experience was shaped by the great victory over fascism. 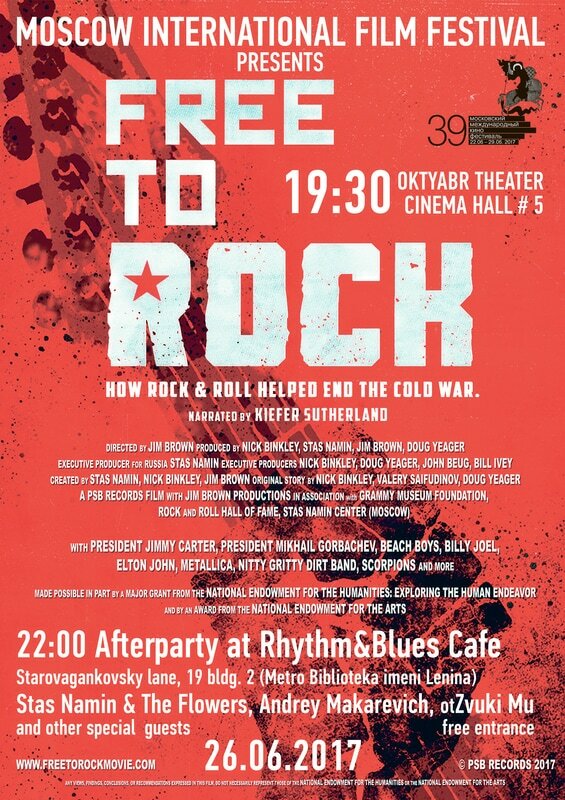 FREE TO ROCK screened to a full house at the Moscow International Film Festival Monday, June 26th at 7:30PM in the Oktyabr Theater, Cinema Hall #5. ​Free To Rock Director, Jim Brown, and Producers Nick Binkley and Stas Namin were there for a panel discussion after the film. 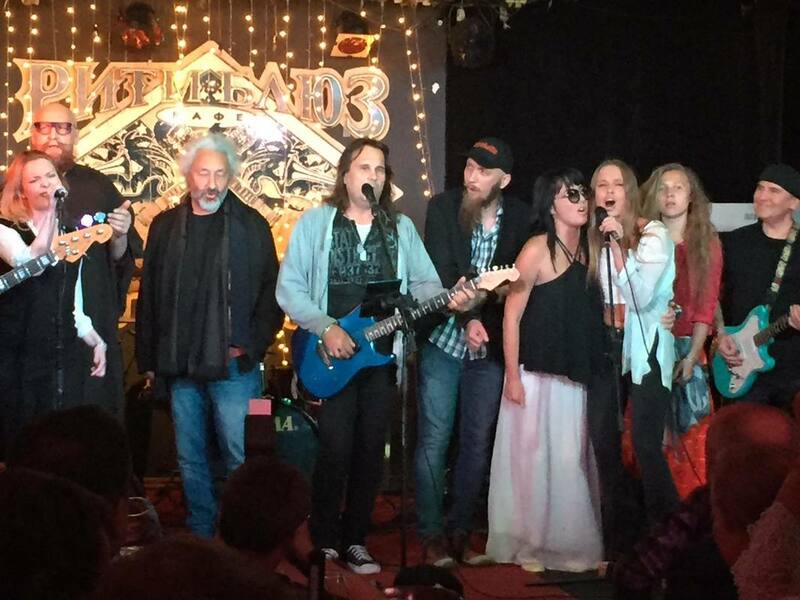 The after party at the Rhythm & Blues Cafe with Stas Namin and The Flowers, Andrey Makarevich, Zvuki Mu and other special guests was a hit. After each screening, Producers Douglas Yeager and Nick Binkley participated with professors and diplomats in a socio-politico panel discussion on how the power of music and culture can effect social change in society (even authoritarian societies), and the vital importance today for maintaining cultural diplomacy in dealing with nations, governments and societies. ​On May 29th at the Hebel Gymnasium High School in Lorrach, Germany. FREE TO ROCK Producers Nick Binkley and Doug Yeager presented their film to this auditorium full of 12th graders, preparing themselves for their university experience. The students were very impressive. 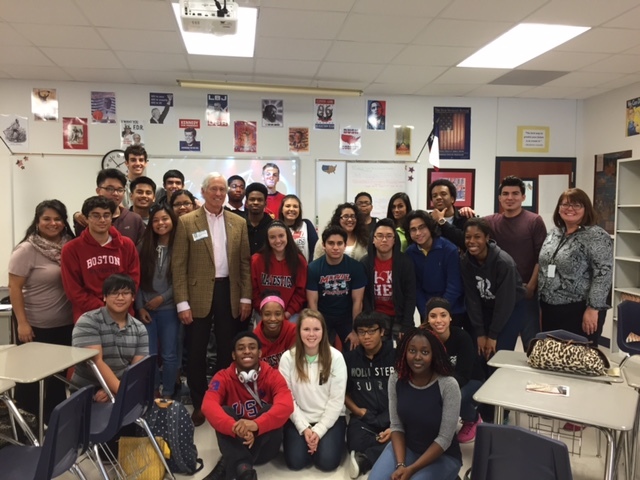 Everyone one of them spoke English fluently, and they were also fluent in Cold War history. FREE TO ROCK Producers Nick Binkley and Doug Yeager, with co-sponsors Max Plank Institute, VHS Forum and the Schoepflin Stiftung, present the film in Cologne, Germany, on May 30th. 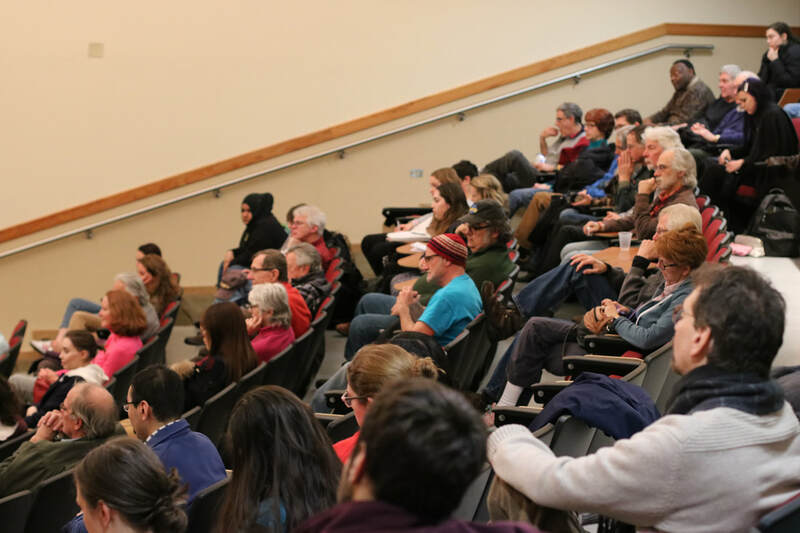 It was a very literate and aware socio-cultural-political adult audience at the VHS Forum auditorium. The discussion and Q&A following the screening, was moderated by Sarah Brasack, Editor of the Kolner Stadtenzinger, Cologne's most important newspaper. FREE TO ROCK'S program was presented at the Alabama Cinema in the most impressive Kampnagel Cultural Center. Following the screening, Schoepflin Stiftung's Director Tim Goebel, moderated a panel discussion with the film's producers Doug Yeager and Nick Binkley and Kampnagel's music coordinator Marcel Bisevic. FREE TO ROCK Producers Nick Binkley and Doug Yeager along with Lukas Harlan (of Schoepflin Stiftung), presented a screening and lively discussion and Q&A in Stuttgart at the Nordlabor Shauspiel. Nick closed the evening with a performance of Dylan's "A Hard Rain's Gonna Fall." What a wonderful theatre complex and great production team in Stuttgart. ​The U.S. Embassy in Prague presented FREE TO ROCK at their American Center. It was a full house, as U.S. Cultural Attache Anthony Jones introduced the film, then moderated the discussion and Q&A with audience and the film's producers Nick Binkley. 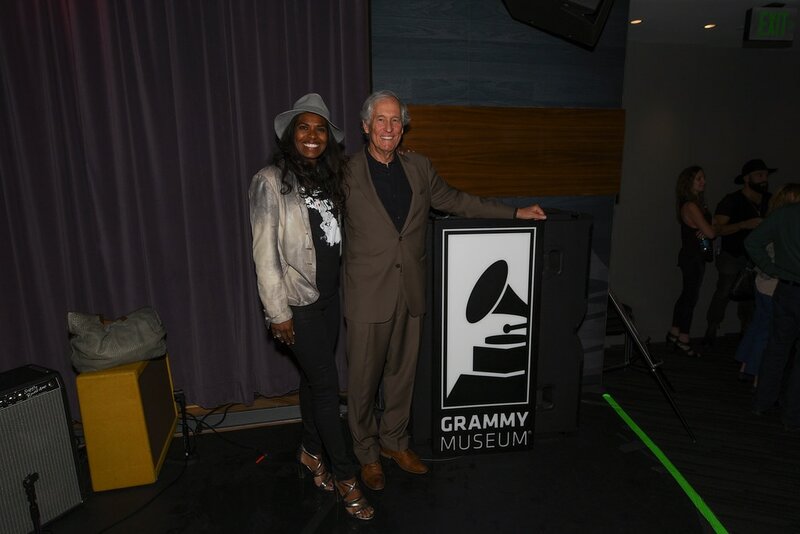 The program concluded with Nick performing "A Hard Rain's Gonna Fall," the Bob Dylan song that Patti Smith performed when accepting the Nobel Prize for Dylan. Free to Rock was shown at the Museum of Pop Culture (formerly EMP Museum) May 21st through May 29th at 3PM daily. 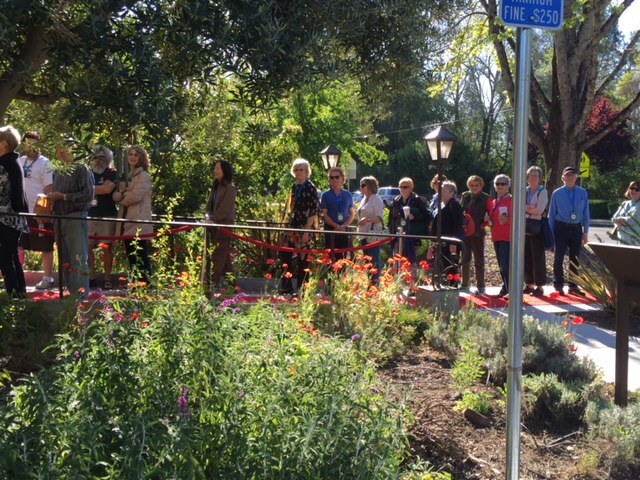 The movie was FREE with museum admission! ​On April 28th, the Grammy Museum of Los Angeles Premiered FREE TO ROCK at their Clive Davis Theatre. 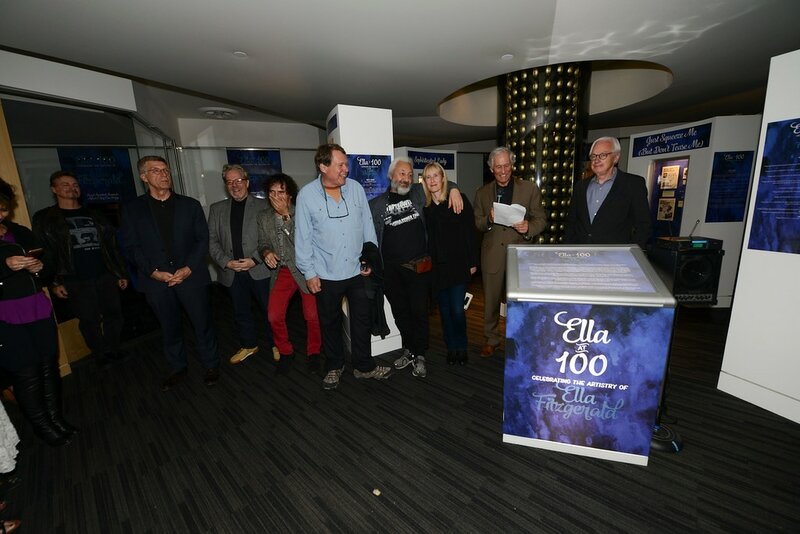 The pre-screening reception was filled with the leading figures of the city's entertainment, corporate, political and academic arenas, along with young, hip millennials and the senior baby boomers who lived through the nuclear fear of the Cold War. 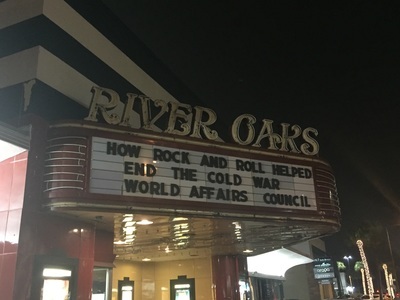 Subsequently, the packed theatre audience embraced the film's gripping storyline of how Rock & Roll helped end the Cold War -- while learning of the harsh struggle between the Kremlin and the youth, as dramatically recounted by the Iron Curtain rockers who fought the three-decade-long battle with the KGB. 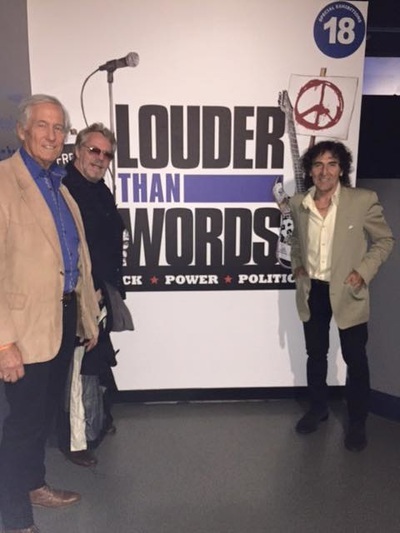 Their stories were supported with historic analysis by Presidents Carter and Gorbachev, a KGB General, and a NATO chief, in addition to incisive commentary from the rockers from the West who performed behind the Iron Curtain -- Billy Joel, the Beach Boys, the Nitty Gritty Dirt Band, Elton John, and the Scorpions. These artists, along with Elvis Presley, The Beatles, Bruce Springsteen, Cyndi Lauper (at The Wall Concert in Berlin), and Metallica are shown giving compelling performances before ever-growing, enthusiastic and rebellious audiences, as we experience the powerful force of rock music and why the Soviet communists couldn't stop its Sound of Freedom, or prevent it from creating a youth revolution that would significantly contribute to the implosion of their system and their empire. Following the audiences' long thunderous applause, the Executive Director of the Grammy Museum, Bob Santelli, who was also a key interview subject in the film, moderated a panel discussion of the making of the film with Director Jim Brown, American Producers Nick Binkley and Doug Yeager, Russian Producer Stas Namin (who also is an interview subject and performer in the film), Executive Producer Bill Ivey (former Chairman of the NEA), Professor Mark LeVine (an interview subject), and Joanna Singray, the first American producer of Soviet rock and a key interview subject in the film. The entire audience remained in their seats with rapt interest in the making of the film and in its thesis of how the power of music and culture can effect change in society...even authoritarian societies . Finally, as a Special Surprise, Stas Namin and The Flowers, the legendary Soviet rock band, who had flown in from Moscow for the Premiere, took the stage and gave a blistering rock performance, singing their hit songs.... for the first time in English. The audience was not only thrilled and overwhelmed, but shocked that Russian rockers are every bit as good as their American and British counterparts, while bringing American rock fans just as much joy with their performance. 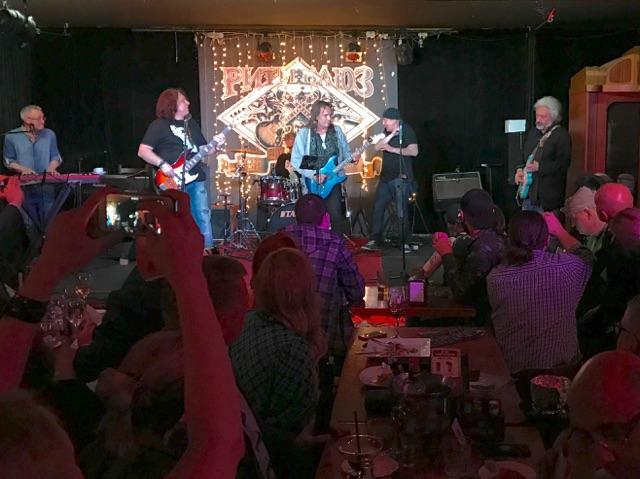 For one night, amidst all the concerns and growing tensions between America and Russia today, we experienced the possibility that Rock & Roll may still be the most effective tool of international diplomacy in dealing with two nations' opposing policies. Following their European tour, Nick Binkley and Douglas Yeager, co-producers of the documentary film “Free to Rock, landed in Tunisia where they were able to show their documentary at El Makhzen Cultural Center, the American Corner in Tunis, the IRC and the Tunis Film school. 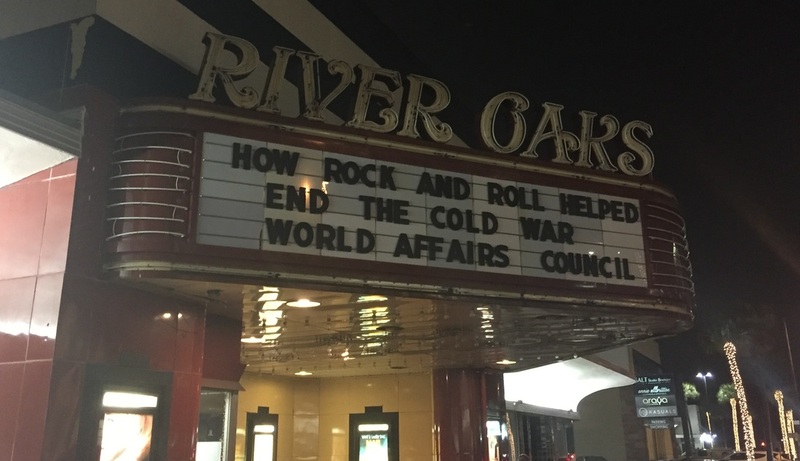 Their film, focusing on the soft power of the Rock & Roll music in changing the hearts and minds during the cold war era, yielded a lively discussion that centered on how certain forms of music and art forms can change societies from the inside. 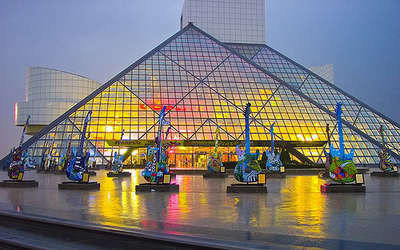 The Rock & Roll Hall of Fame presented FREE TO ROCK in their Foster Theater to a near- full house of passionate fans of rock music, who expressed their interest in the power of rock music and the incredible story of how it helped end the Cold War and contributed to the collapse of the Soviet Union. 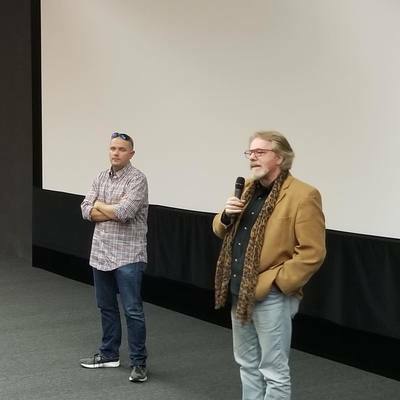 Rock Hall president Greg Harris and vice-president Jason Hanley introduced the film followed by our producer Nick Binkley providing the audience with the background of the making the film, which began filming eleven years ago this week in Latvia. The audience responded enthusiastically to the film, and remained in their seats for the next hour for a panel discussion and Q&A, moderated by Jason Hanley, with the film's director Jim Brown, producers Nick Binkley and Doug Yeager, and Soviet rock pioneer Valery Saifudinov. This event is part of the Rock Hall's new exhibition, "Louder than Words: Rock, Power & Politics." 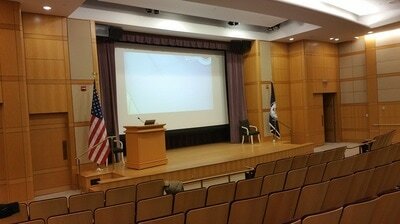 On Friday, May 13th, the U.S. Department of State, screened FREE TO ROCK at their George C. Marshall Center in Washington, DC. 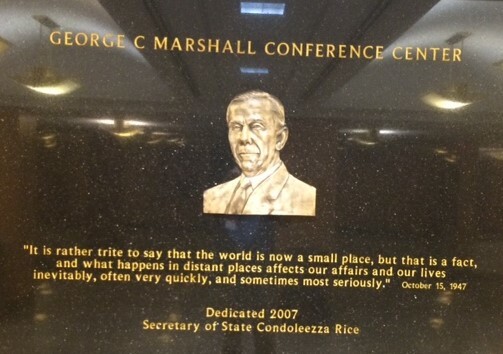 for their foreign service officers. 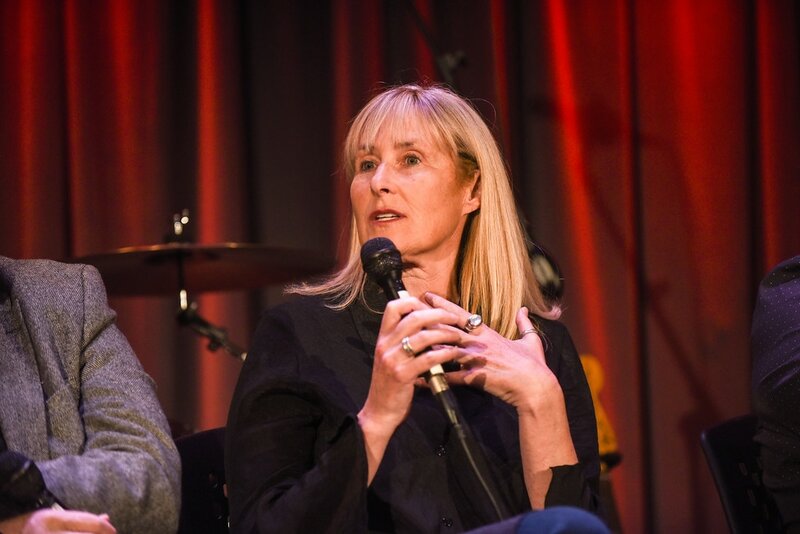 Chief Cultural Affairs Director of the State Department, Amy Bliss welcomed the audience, then introduced Mark Taplin, Principal Deputy Assistant Secretary of State, who gave the historical background of the project and introduced the film. 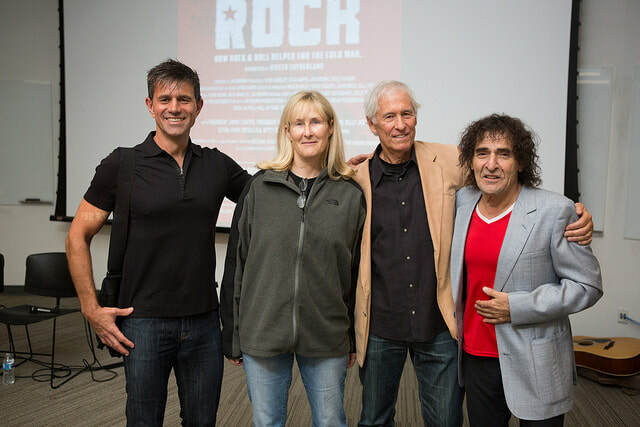 ​After the screening, Amy Bliss moderated a Question and Answer discussion with Free to Rock producer Doug Yeager, former Hungarian Ambassador Andras Simonyi and the foreign service officers. The screening was well attended, the foreign service officers were very enthusiastic about the film, and they participated in spirited exchanges during the Q&A. Mark Taplin and Amy Bliss were very pleased with the results and plan to share the film with their embassies in Europe. 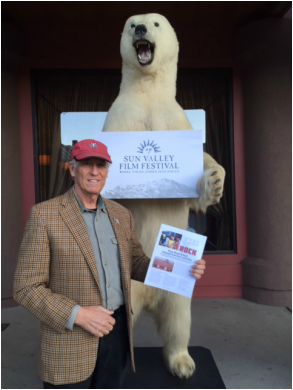 "FANTASTIC MOVIE AND TERRIFIC EVENT. CONGRATS!" -Professor Michael McFaul, U.S. Ambassador to Russia. 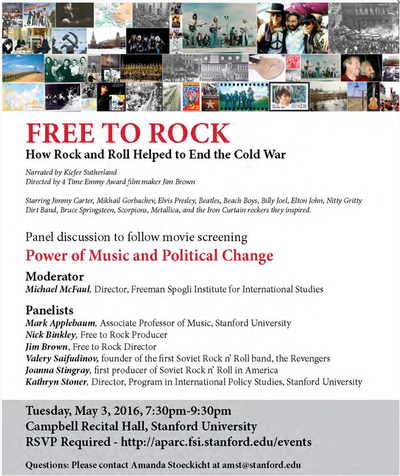 The Campbell Recital Hall at Stanford University was full on Tuesday night for Free to Rock's screening, presented by Stanford's Department of Music, Freeman Spogli Institute for International Studies, and the CREEES Center for Russian, East European & Eurasian Studies, and hosted by Professor Michael McFaul (former U.S. 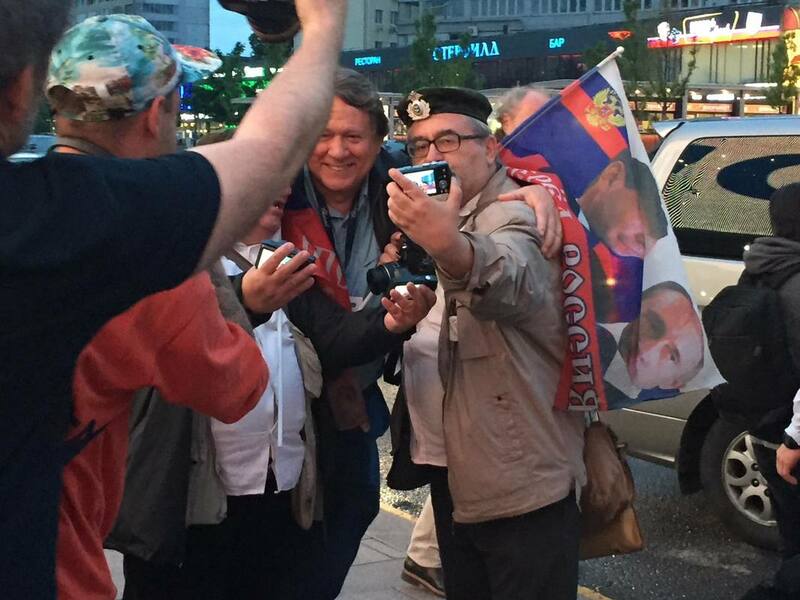 Ambassador to Moscow). 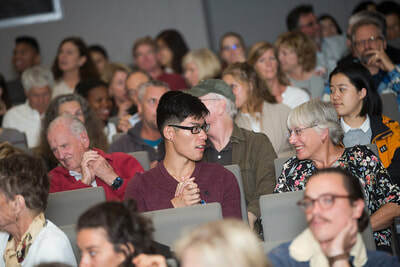 The audience was very enthusiastic in their response to the film and remained in their seats for the panel discussion following the film. 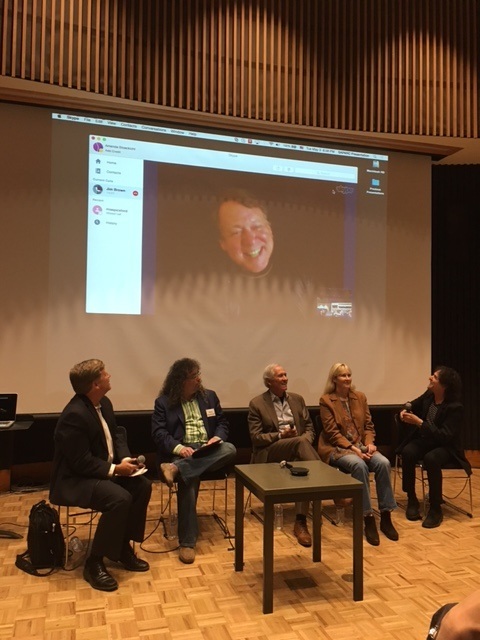 The panel was moderated by Professor McFaul, which included Professor Mark Applebaum, our producer Nick Binkley, our film's musician/interview subjects Joanna Stingray and Valery Saifudinov, and our director/ producer Jim Brown, who was skyped in from New York. 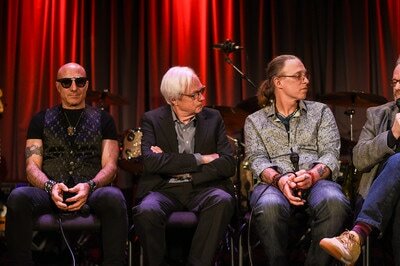 It was a scintillating discussion about two opposing theories: the power of music and culture to affect change in dictatorial societies vs. the hard aggressive power of the military and the intelligence services. Meanwhile, Valery and Joanna ably provided their first-hand experiences of being a rock musician in the USSR, where Rock & Roll is prohibited. 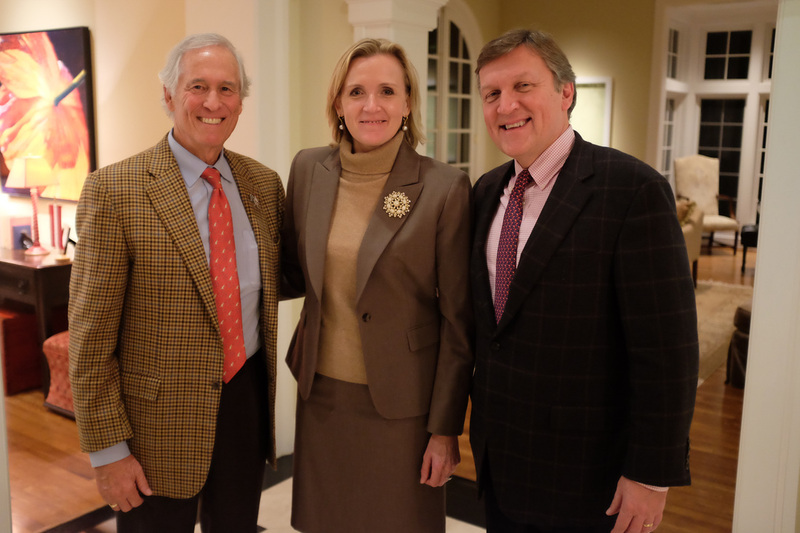 Thank you to everyone who made it such a great evening! Farah Killidar, President and CEO of the World Affairs Council of Houston, and Chetana Baskota, Director of Programs at WAC, had invited us to screen the film in Houston. On Thursday evening, January 14th, the WAC presented the film at the historic art deco River Oaks Theater in Houston, to a capacity audience made up of their members, in addition to twenty high school students and their history teachers. 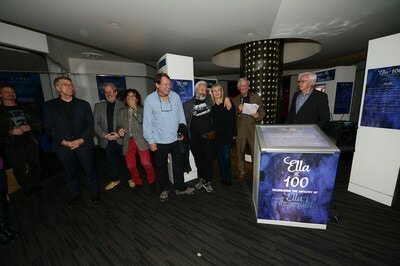 The film was enthusiastically received. Immediately following the film, Nick Binkley held a Q&A for forty minutes with the audience -- all who remained in their seats. Earlier that day, the WAC office arranged for Nick to speak to an 11th grade class at Manvel High School in Houston about the power of music and the soft power of American culture to affect social change. 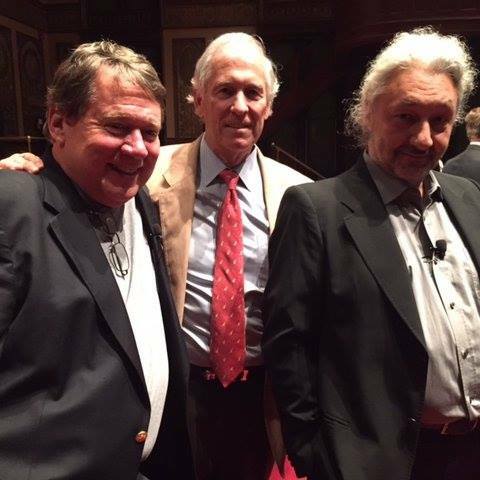 That evening after the film, Peteris Ragauss, a member of the Board of Directors of the WAC of Houston, hosted a post-screening reception at his home in River Oaks. Given the successful turnout and response, Ms. Killidar and Baskota have expressed that they are happy to recommend the film to other WAC offices in other cities around the U.S. 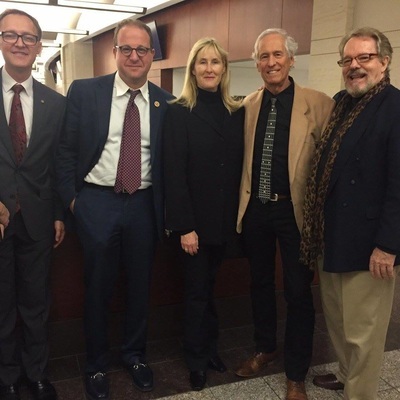 Sponsored by the Congressional Humanities Caucus, the Congressional Arts Caucus and Congressman Jared Polis, with support from the National Endowment of Humanities and the National Endowment of the Arts. RECEPTION: Hosted by the sponsors and producers of the film, prior to the screening at the U.S. Capitol, with introductory speeches by Congressman Jared Polis, NEH Chairman William Adams and NEH Chairwoman Jane Chu. 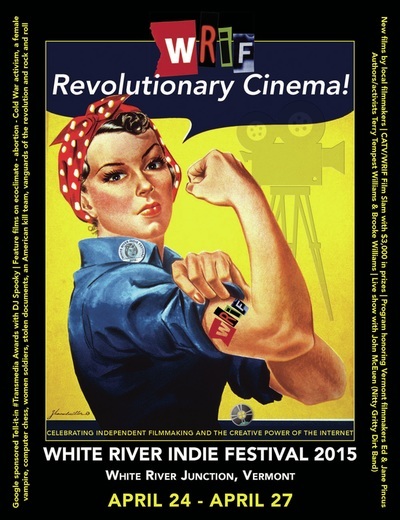 SCREENING: Presented by the Congress at the U.S. Capitol's South Orientation Theatre. 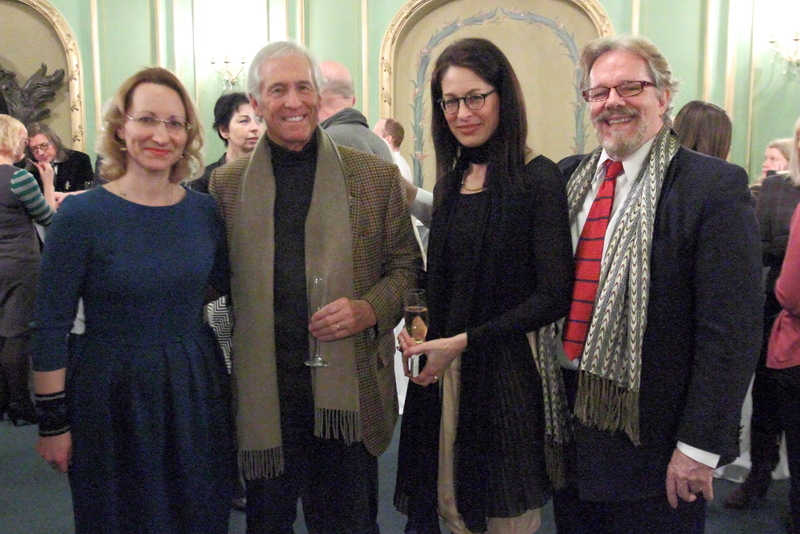 Among the guests were the entire staffs of the Latvian and Slovakian embassies, including Ambassador Andras Razans of Latvia and Ambassador Pete Kmeck of Slovakia. 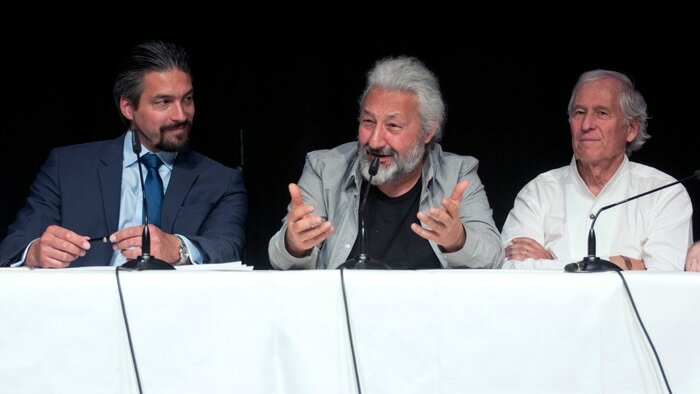 The response to the film was most enthusiastic and everyone stayed for the panel discussion. 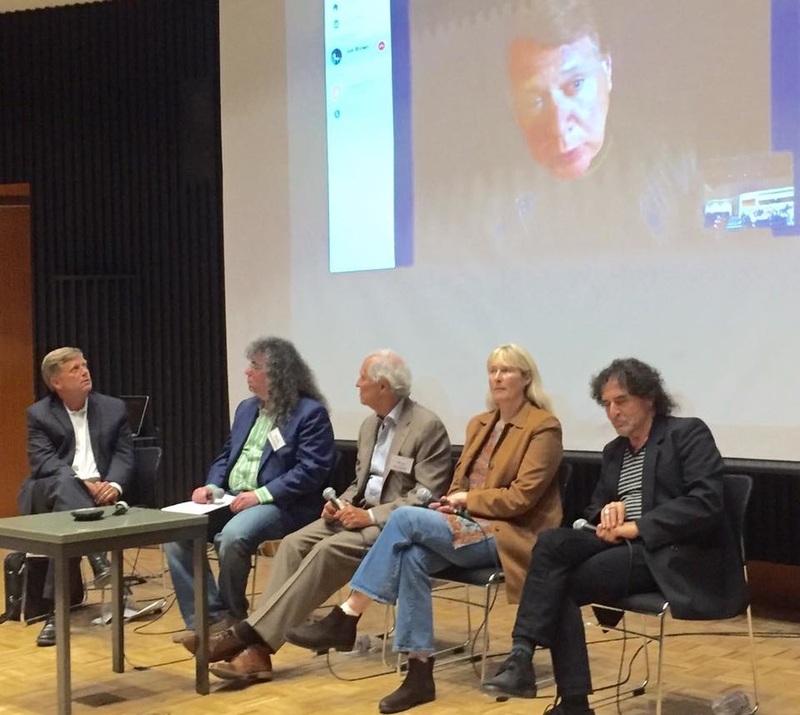 PANEL DISCUSSION: Moderated by former NEA Chairman Bill Ivey. 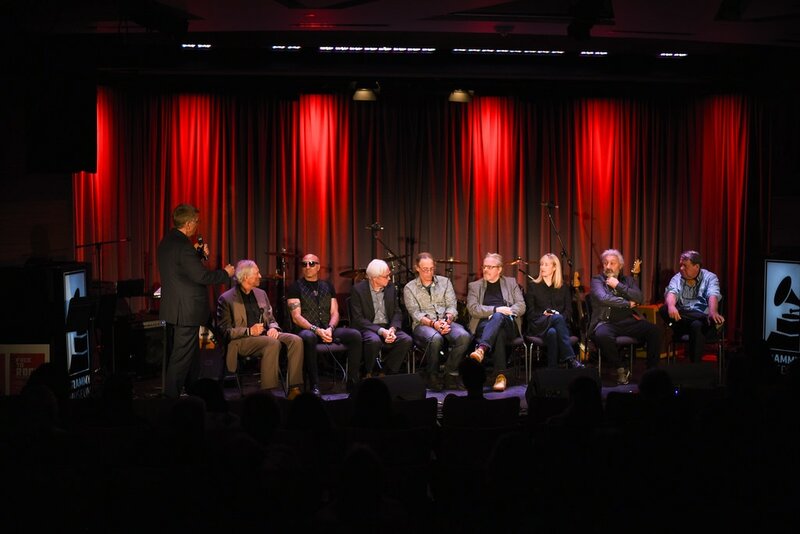 Panelist included: Free to Rock's Director/Producer Jim Brown, American Producers Nick Binkley and Doug Yeager, and Russian Producer Stas Namin; film interview subjects Valery Saifudinov, Joanna Stingray, and Doc McGhee; and the President of the Rock and Roll Hall of Fame Greg Harris. 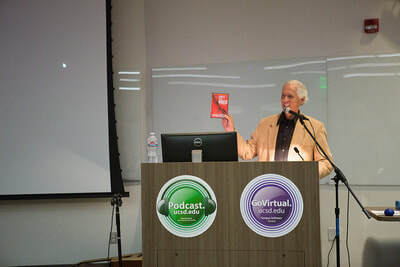 A fascinating discussion evolved with the audience about the soft power of American culture, how it was able to contribute to the collapse of the communist system behind the Iron Curtain during the Cold War, and how it can be a useful tool today. FREE TO ROCK CONCERT AND POST-RECEPTION: After the Screening and Panel Discussion, a Free to Rock Post-Reception and Concert was jointly hosted by the Latvian and Slovakian embassies at the Slovakian Embassy in Washington. 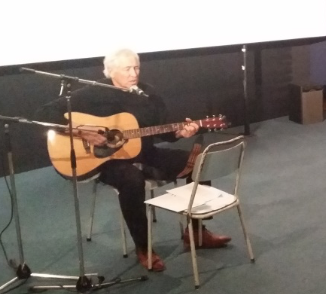 Former Hungarian Ambassador Andras Simonyi, an interview subject in the film, led his rock band Coalition of the Willing, for a 75 minute concert, and was joined on stage for the performance by Soviet rock pioneer Valery Saifudinov, a featured subject in the film. 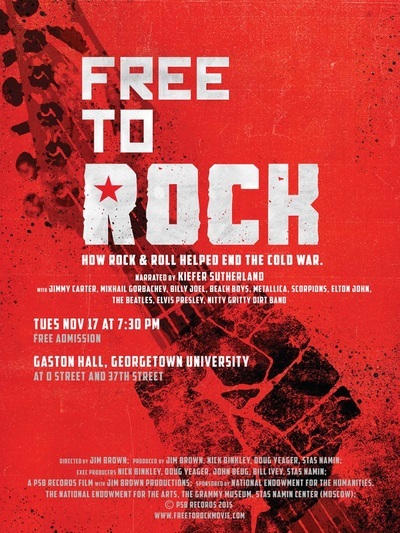 A star and dignitary studded feature length documentary chronicling the fascinating story of how western rock music contributed to ending the Cold War, will have its Washington, D.C. screening in Gaston Hall at Georgetown University on Tuesday, November 17 at 7:30 p.m. 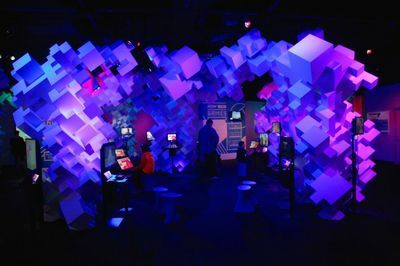 The event is free and open to the general public. 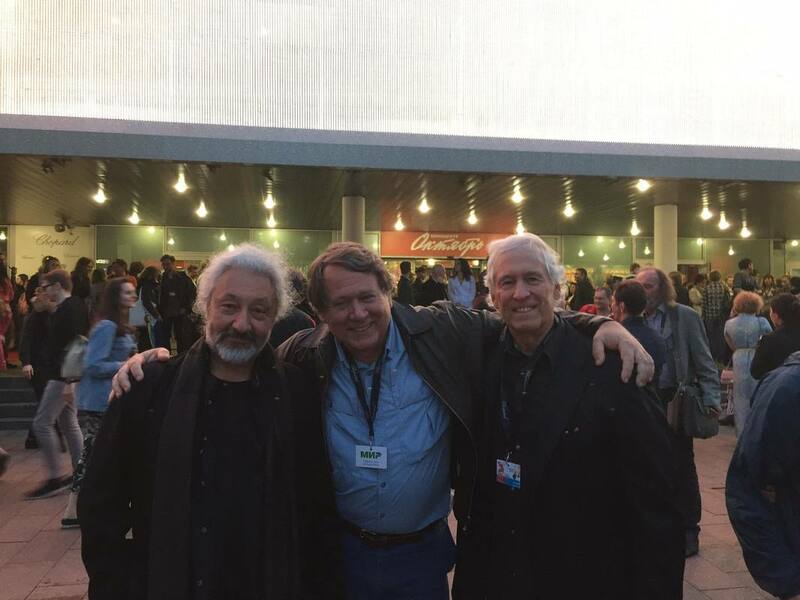 Monday, April 27th - LEBANON OPERA HOUSE (Lebanon, NH), following the screening of the film, Free to Rock's director Jim Brown, will be joining (via Skype) with co-producer Doug Yeager, and Professor Christopher Wren and musician John McEuen for a Q&A with the audience. Immediately following the Q&A, John McEuen, featured musician in the film, will give a concert. 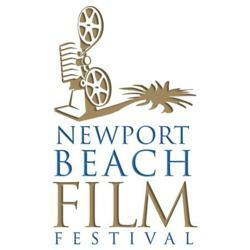 The Newport Beach Film Festival seeks to bring to Orange County the best of classic and contemporary filmmaking from around the world. 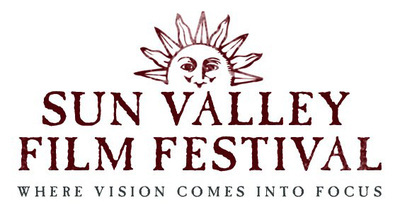 Committed to enlightening the public with a first-class international film program, a forum for cultural understanding and enriching educational opportunities, the Festival focuses on showcasing a diverse collection of studio and independent films. 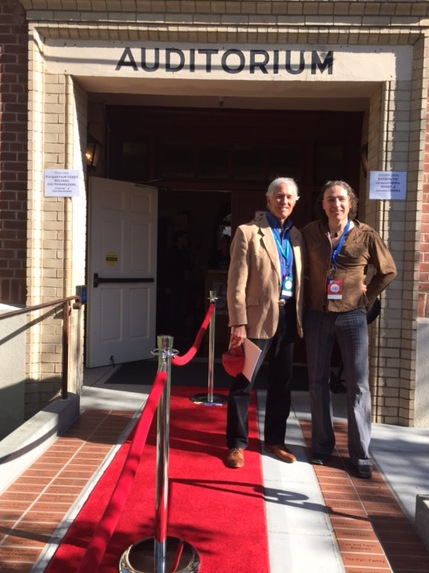 Immediately following the 4:30 pm screening of the film on Saturday, April 25th, Free to Rock's Co-Producer Nick Binkley and Executive Producer John Beug, will be joined in a Q&A by Professor Mark LeVine from University of California/Irvine, and pioneer Soviet rocker Valery Saifudinov (both interview subjects in the film). Following 5:15 pm screening on Monday, April 27th, Free to Rock's Co- Producer Nick Binkley will be joined for a Q&A with the audience by Soviet rock pioneer Valery Saifudinov, a featured subject in the film. 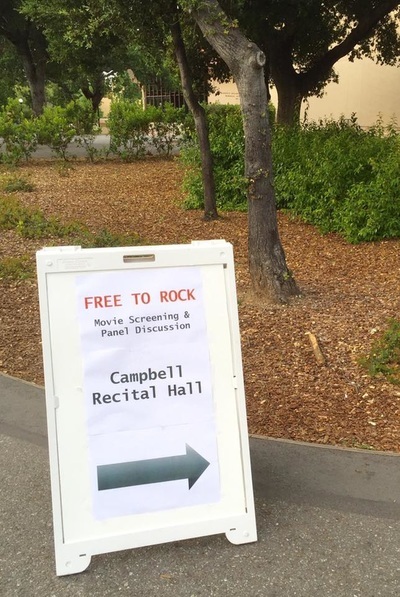 Free to Rock's screening at the Sonoma International Film Festival was an unqualified success. Capacity crowd. Big response! 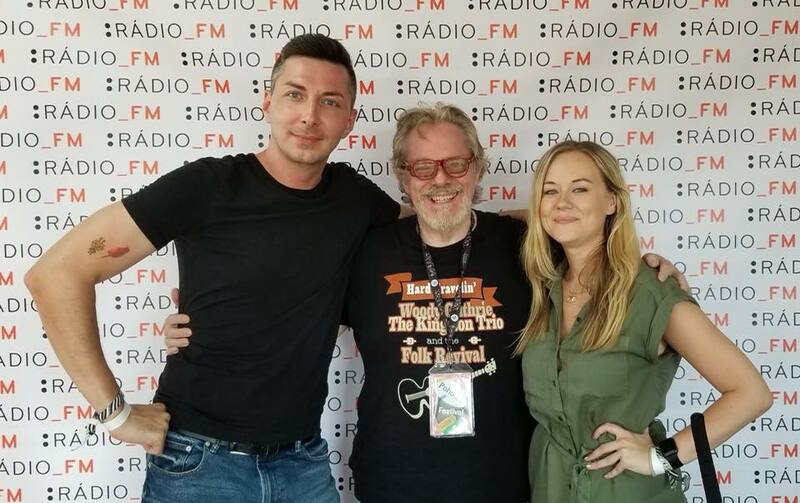 Two radio stations made live interviews with our producer Nick Binkley discussing the film. 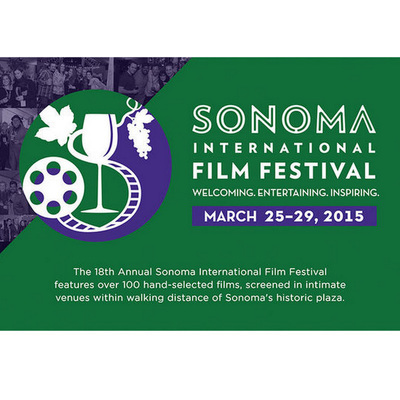 An Eye Opener - Just saw Free to Rock at the 18th Sonoma International Film Festival and it was super great. As a Foreign Service Officer posted to Budapest, Hungary 1989-92 all throughout the opening up of the Eastern Bloc I was astounded by how the people knew all the music, words and sounds, as one after another Western musicians came to play Budapest. 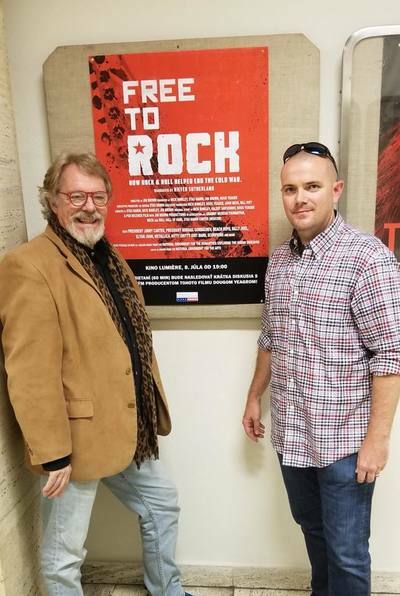 This documentary helped me to better understand just how rock and roll and other forms of western music got through the repressive and sometimes violent acts by the authorities to try to keep it out. Essential viewing for anyone who cares about the influence of pop music in repressive regimes. GREAT ARCHIVAL FOOTAGE!! 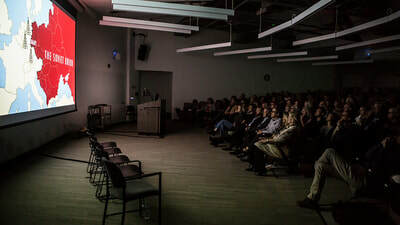 LATEST UPDATE: This event, and subsequent screenings/ discussions at various Latvian universities was sponsored by the U.S. Embassy, under the leadership of their Chief of Mission (Acting Ambassador) Sharon Hudson Dean, in coordination with Dace Melbarde (the Latvian Minister of Culture), and Ieva Morica, (the Latvian Director of the Open Society Foundation). If not for the grand success of this initial tour of Latvia and Latvian television's licensing the film, the subsequent screening and discussion tours of France, Germany, Czech Republic, Slovakia and Tunisia would certainly not have occurred, and the licensing of the film to television networks throughout Europe would not have been possible. Producer Doug Yeager re-connected with Sharon Hudson-Dean, now U.S. Consul General in Sydney, Australia, over dinner in New York City during the holidays. FREE TO ROCK’s screening in Riga, Latvia, a Smash Hit! Our first European film screening, of what will be many FREE TO ROCK screenings prior to its release and airing in America, was produced on March 11th in Riga, Latvia, the country where the film project began ten years ago – the country where Rock & Roll first entered the Soviet Union. 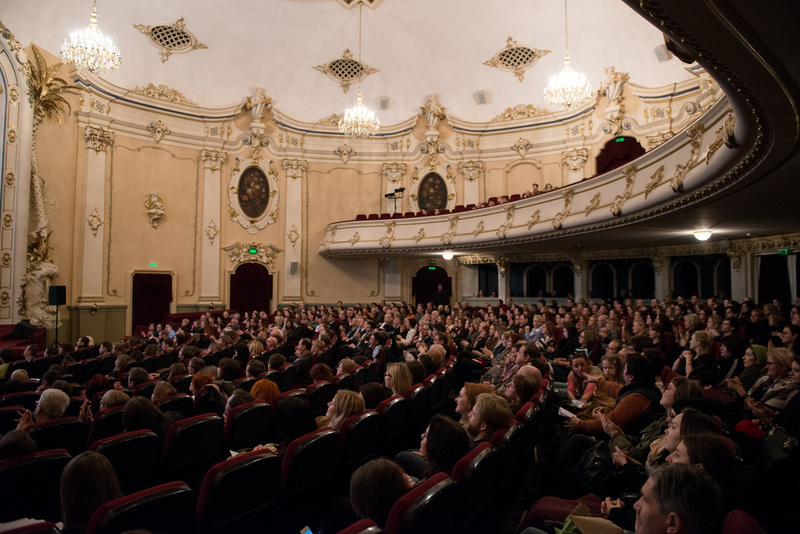 The screening, produced in cooperation with the Foundation for an Open Society/DOTS, the Latvian Ministry of Culture, the Latvian Film Centre and the U.S. Embassy, was presented at Riga’s Splendid Palace Theatre, renowned as the most historic and ornate film palace in the Baltics. The theatre’s 550 seats were all reserved and taken, while the 200 names on the waiting list are being accommodated March 19th in a separate special screening at another cinema in Riga. Opening remarks and introductions to the SRO audience were given by: The Honorable Dace Melbarde, Latvia’s Minister of Culture; The Honorable Sharon Hudson-Dean, United States Charge d’Affaires to Latvia; and Ms. Ieva Morica, Executive Director of the Foundation for an Open Society/DOTS. 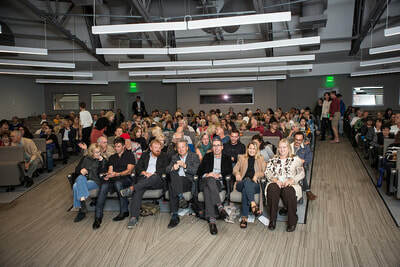 At the conclusion of the film, the audience gave a wildly enthusiastic response, and then stayed to listen to and participate in the panel discussion, moderated by Latvian cultural journalist Paul Raudseps, with: Latvian Member of Parliament and Chairman of its Foreign Affairs Committee, Ambassador Ojars Kalnins; the Father of Latvian Rock & Roll and one of the featured artists in the film, Pete Anderson; and Co-Producers of FREE TO ROCK, Nick Binkley and Doug Yeager. 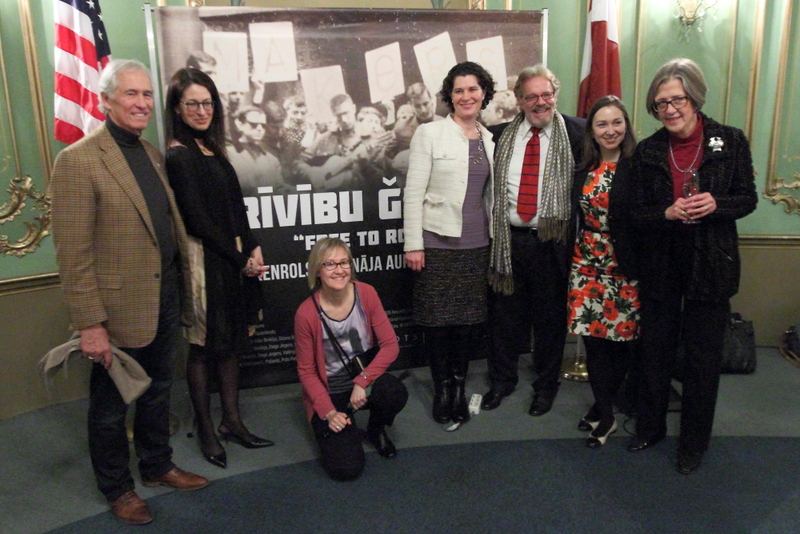 Following the film screening and panel discussion, a wonderful reception was held upstairs in the theatre’s elaborate Green Room, which was attended by high ranking Latvian government officials, including Ms. Melbarde and Ambassador Kalnins (both of whom expressed that the film brought them to tears); Ms. Hudson-Dean and the officers of the U.S. Embassy; Open Society's Chairman from Netherlands, along with Ms. Morica and the Latvian staff; two Professional Staff Members of the U.S. House Committee on Foreign Affairs; a Senior Advisor from the U.S. State Department’s U.S. Advisory Commission on Public Diplomacy; foreign diplomats; Latvian rock stars and entertainment celebrities; and the media and press. After the reception, everyone was treated to a killer concert by Pete Anderson & The Swamp Shakers which garnered four encores! 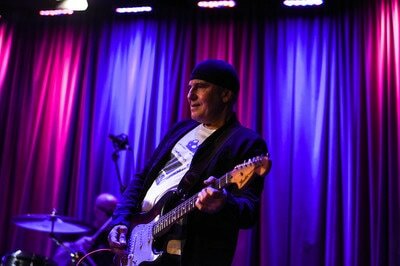 You can see his performance of “Red Hot Mamas” on YouTube.com at Pete Anderson, Rock Café, Riga Latvia. While in Latvia, our Co-Producers Binkley and Yeager also gave lectures, screenings and Q&As at Riga Stradins University and Daugavpils University, in addition to the University of Latvia; and were honored to be hosted for a dinner at the residence of Acting Ambassador Hudson-Dean and her husband Leon Hartwell, along with the collaborative parties that produced the events: Minister Melbarde; Ambassador Kalnins; Ieva Moric; the Director of the National Film Centre, Dita Rietuma; Pete Anderson; Political Science Professor Ivars Ijabs of the University of Latvia; U.S. Embassy Cultural Attache, Katherine Giles-Diaz; and Paul Raudseps. We look forward to interacting with you and having your support for future FREE TO ROCK special events. "Thank you! A must see movie for those who were born in the 60s and after 1991! Impressive – history explained through music! Emotional!" 'Wind of Change' būs šī vakara dziesma pēc 'Brīvību Ģitārai' filmas noskatīšanās. #FreeToRock Absolūti fantastiska filma. "Wind of Change” will be the song of this evening after viewing the film “Free to Rock”. Absolutely marvelous film!" @fondsDOTS Ļoti ĻOTI laba filma! Pilna brīžiem, kad uz ķermeņa 'uzmetas' viegla zosāda..
"A VERY good film, full of creepy moments." 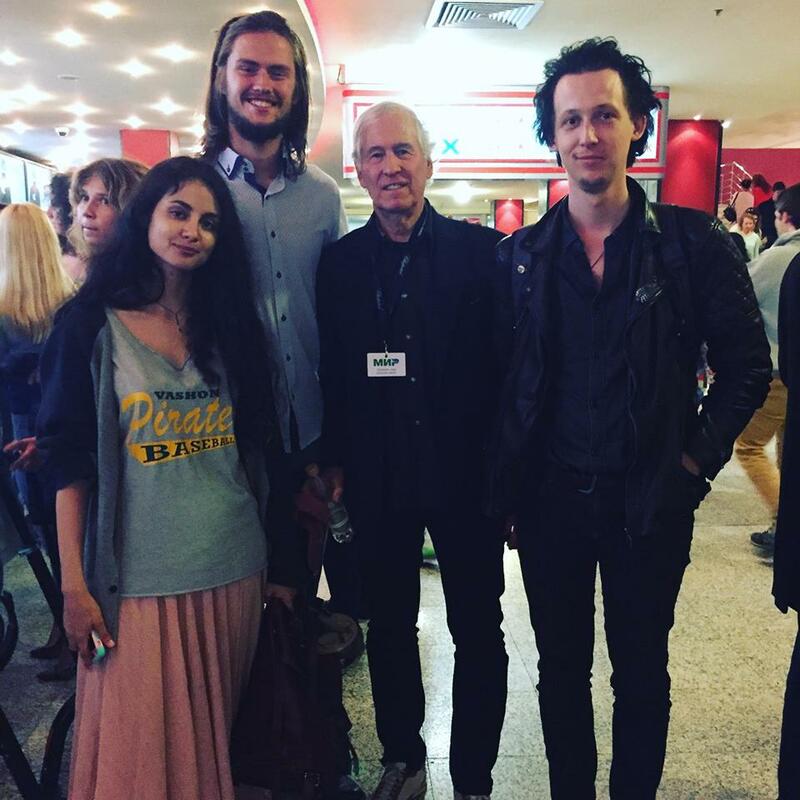 "A very positive and energetic film on the changes in Eastern Europe, the role of rock music. 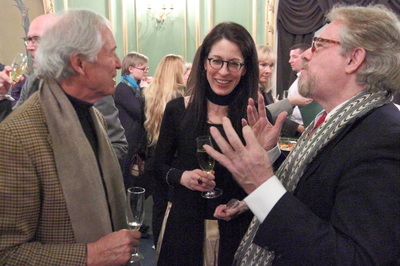 Concluding discussion at the Splendid Palace." March 10th (daytime) - University of Latvia in Riga: Free to Rock producers Nick Binkley and Doug Yeager will give a lecture on the soft power of culture and art - in this case Rock & Roll - how it can help to cause change in societies, and how Rock & Roll was a contributing factor in weakening the communist system during the Cold War, which inspired, fueled and helped liberate Latvia from Soviet occupation. 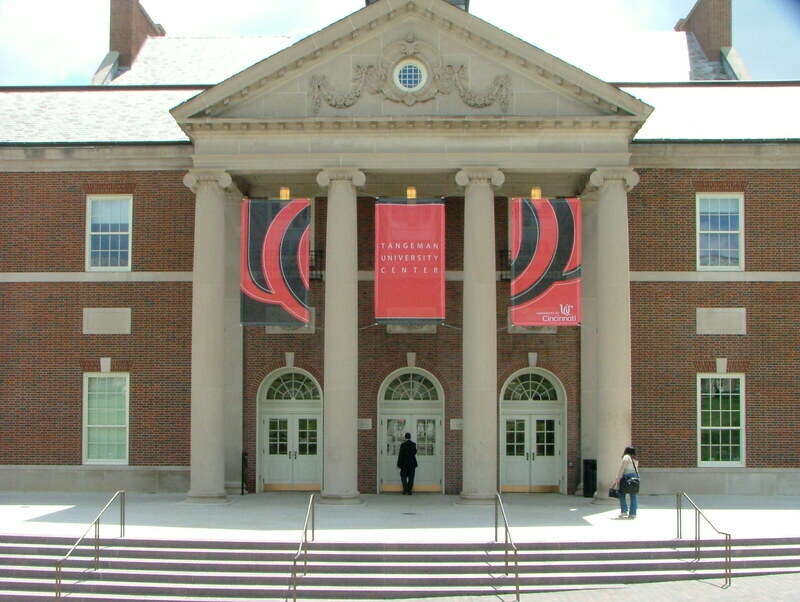 The film will then be screened, followed by a Q&A with professors and students. 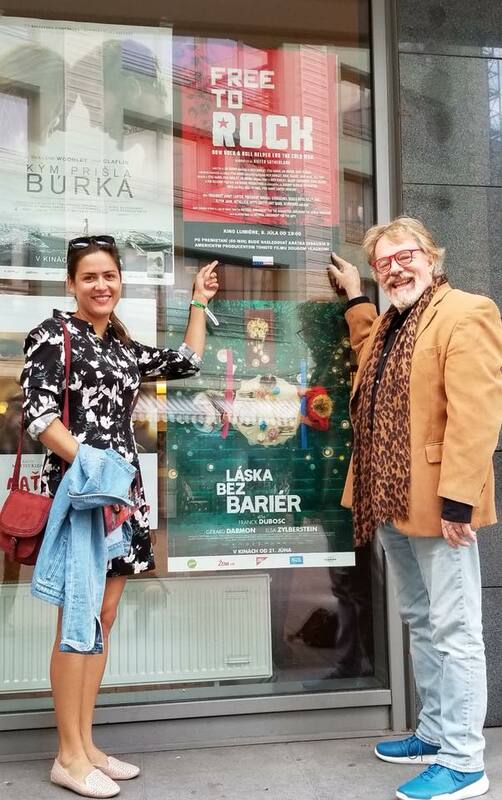 March 10th (daytime) - Academy of Culture in Riga: Binkley and Yeager will present a similar lecture, screening and Q&A as the previous day, in addition to a panel discussion on the power of culture and how it can be used in nations' Cultural Diplomacy efforts. 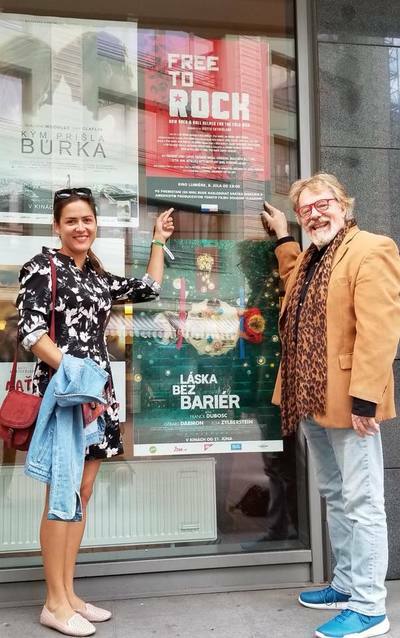 March 10th (evening) - Binkley and Yeager will be hosted by the U.S. Embassy in a dinner and reception to meet and greet the members of the embassy, the Latvian Government and the Foundation for an Open Society DOTS who are cooperating to produce the Premiere and the associated events in Latvia. March 12th - University of Daugavpils, Daugavpils, Latvia (on border with Russia, Belarus and Lithuania). Binkley and Yeager will give lecture, screening, and Q&A with professors and students, similar to events at University of Latvia. 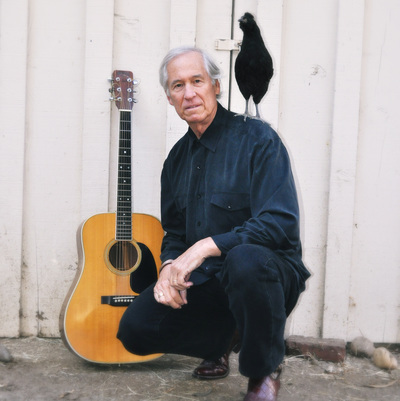 PETE ANDERSON & THE SWAMP SHAKERS: Pete Anderson’s career in Rock & Roll began in 1959, when he played the piano with a college jazz band and sang forbidden American songs, such as Little Richard’s “Long Tall Sally,” and a few Fats Domino songs. His life would never be the same again. 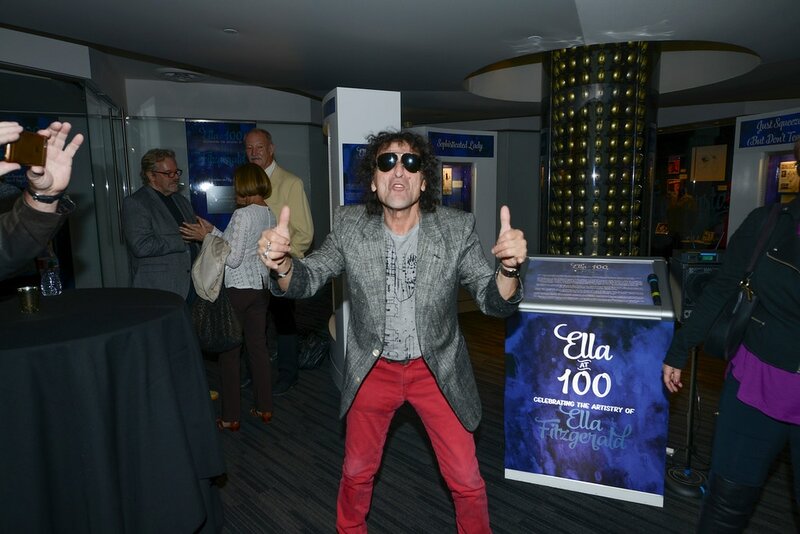 His love of performing an alien music from America was considered a threat by the communist government, and he was arrested a dozen times over the next thirteen years in an attempt to stop him from influencing Latvia’s youth with the freedom-inspiring Rock & Roll music. 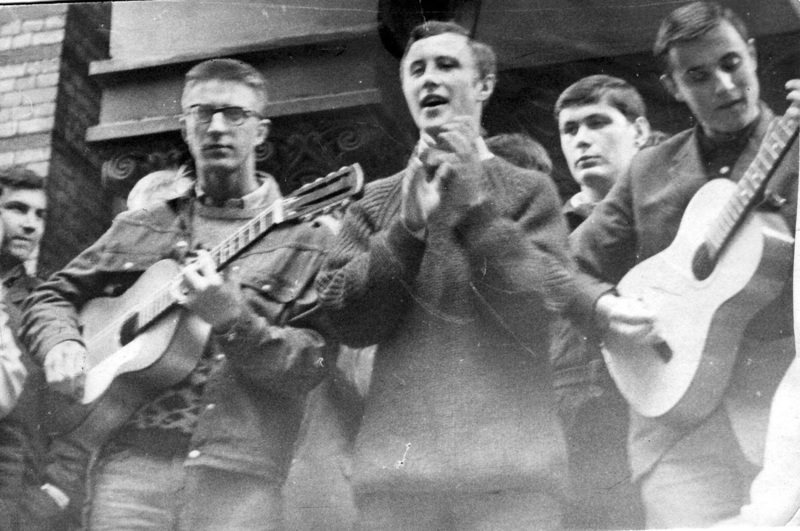 In 1966, he led the Melody Makers in their “Free the Guitar” demonstration against the government. And in 1972, the lives of Pete’s family were threatened by the KGB if he didn’t stop performing Rock & Roll. With great sadness he had to give up his life passion. 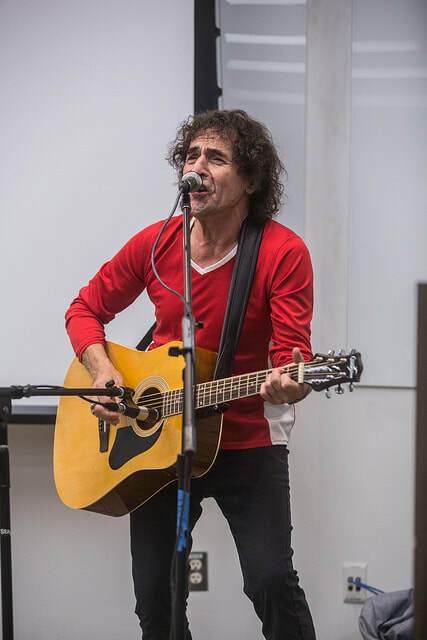 However, more than a decade later, after the arrival of Gorbachev and his Glasnost reforms, Pete was allowed to begin rebuilding his life as a musician and singer. 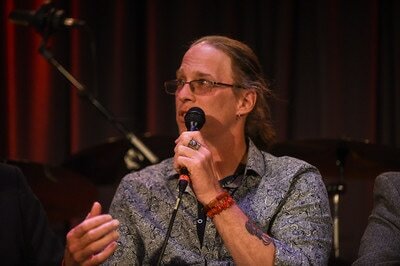 With a new band, Pete Anderson & The Archives, he not only began touring the major venues and festivals in Latvia, but also in Lithuania, Estonia, Russia, Poland….and then he received permission to perform on other side of the Iron Curtain -- in Western Europe (in Germany, Holland, Denmark, Finland and Sweden). 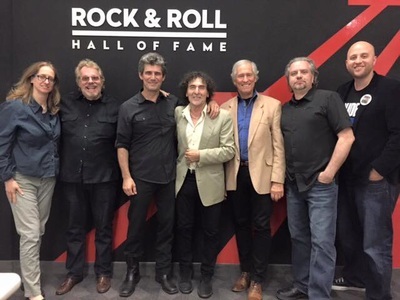 In 1989, he was invited to perform at the major Brean Sands Rock & Roll festival in England and experienced a life-long dream of sharing the stage with Bill Haley’s Original Comets. 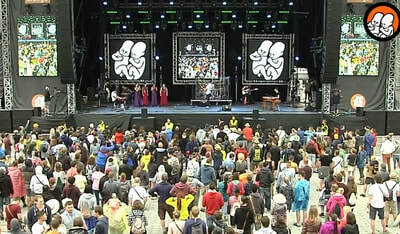 A BBC film crew documented the festival for a 1990 film release with Pete as one of the featured voices in the film. After Latvia achieved its independence, Pete released records, made music videos and toured regularly with no government restrictions. 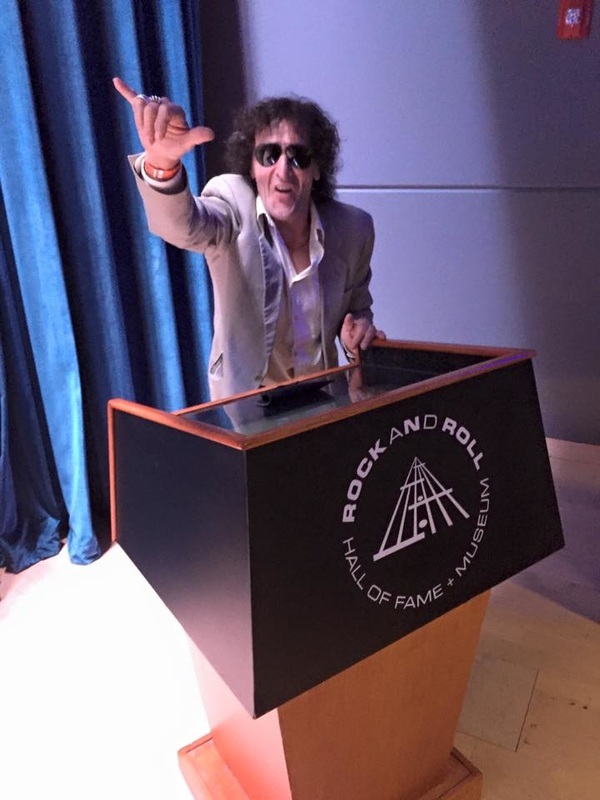 In 1993, Pete was hired by Academy Award winning filmmaker Paul Haggis, as the music and historic consultant to his Hollywood film Red Hot, whose story was about the beginnings of Soviet Rock in Latvia, starring Donald Sterling, Armin Mueller-Stahl, Balthazar Getty and Carla Gugino. Finally, in 1997, Pete realized another lifelong dream, when FREE TO ROCK producer Nick Binkley invited him to record in the USA. 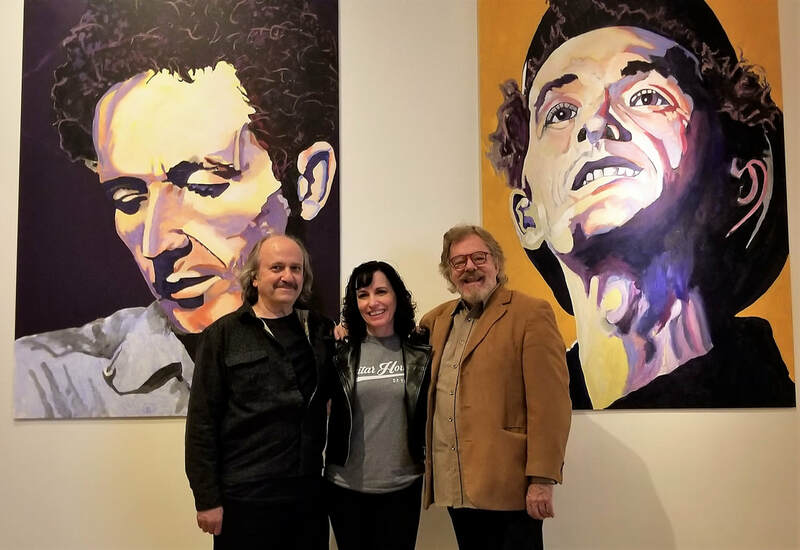 This led to several concerts across America, in the original home of Rock & Roll and Rockabilly music – the music Pete fell in love with as a boy. 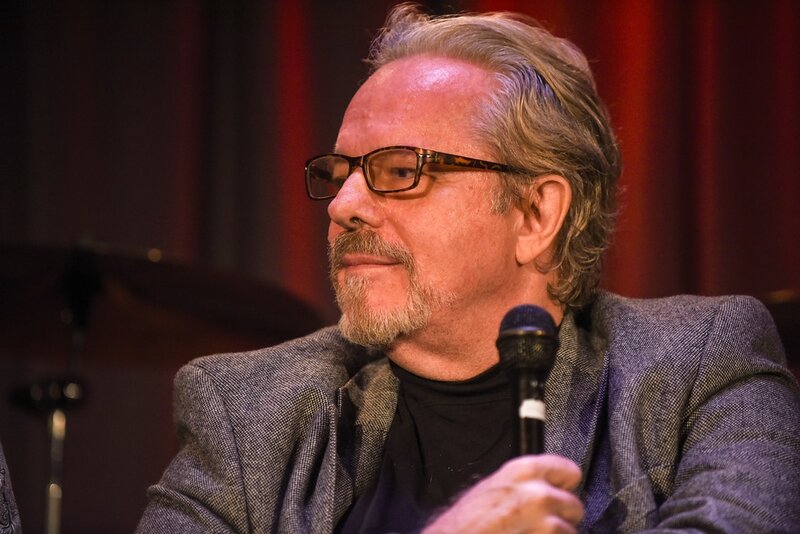 Over the last decade, Pete’s legend grew as the Father of Rockabilly Music in Europe. In 2006, Latvian honored Pete with his own postage stamp. In 2009, his album Brass-A-Billy, was awarded “Best Rockabilly Album of the Year” at the JPF Music Awards in Nashville, Tennessee; and on May 4, 2011, the government of Latvia honored Pete with the nation’s highest civilian honor, the “Order of Three Stars” (“Per Aspera ad Astra”) for his merits of developing Rock & Roll music and for popularizing Latvia’s name around the world. 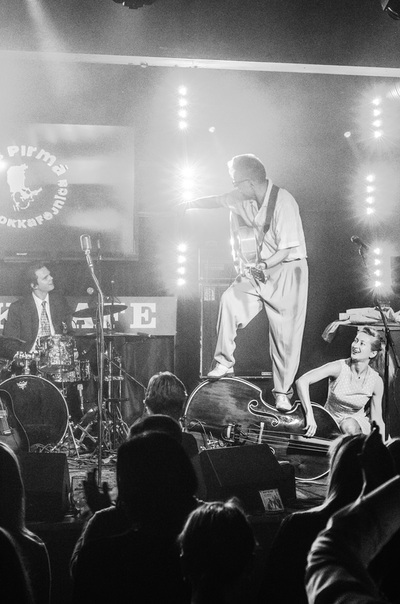 For the past six years, his new band, Pete Anderson & The Swamp Shakers, with their new album Enjoy the Ride, has become one of the most popular Rockabilly bands in Europe, with tours this year extending to even Australia and New Zealand. Pete Anderson was the first interview subject in the film FREE TO ROCK in 2005, and is now a featured subject in the film upon its completion and release in 2015. REVENGERS: The Revengers are acknowledged in Artemy Troitsky’s book, Back in the USSR as the first rock band in the history of the Soviet Union. Founded in 1961 by Valery “Seitsky” Saifudinov, the band initially had to play with acoustic guitar and bass, because the sale and manufacture of electric guitars was prohibited in the USSR. 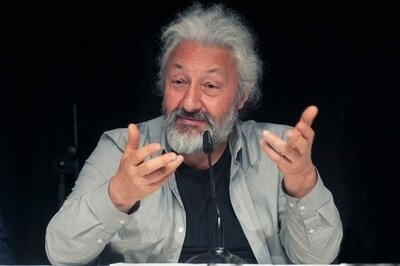 However, within a year, Valery and a friend from electronic school, invented and began making homemade electric guitars and basses, while `borrowing’ the wires and magnets from Riga’s public pay phones to serve as the electronic `pick-ups’ placed under each string of each instrument (six pay phones for six strings of each instrument!). Within one year, there were no operational public pay phones in Riga! As an illegal and unofficial band, the Revengers popularity grew as they performed underground in unauthorized venues in Latvia for four years before “Seitsky” was drafted into the Soviet army. Seven years after Valery and his friend invented the first Soviet electric guitar, and article appeared in the Soviet Popular Mechanics magazine, that obviously went unnoticed by the Kremlin’s censors. It described Valery’s invention and showed diagrams on how to make the guitar. By 1969, the international press reported that no one could find an operational pay phone in Moscow!! 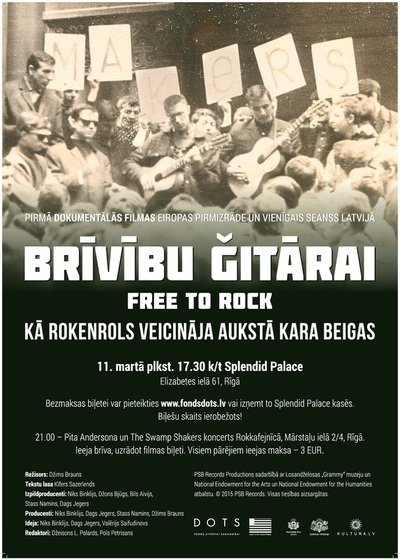 MELODY MAKERS "FREE THE GUITAR" DEMONSTRATION: In 1966, the most popular underground rock band in Latvia was the Melody Makers, led by Pete Anderson. 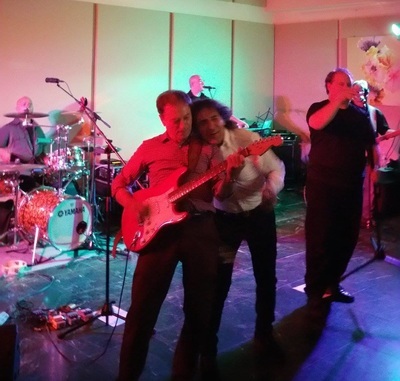 They became the first "unofficial" band in the USSR to acquire a government permit to give a concert. 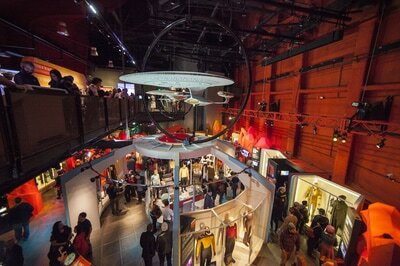 They rented out the Planetarium Theatre (former Cathedral) in Riga for their concert. The theatre manager mistakenly thought that the Melody Makers were a folk ensemble who would be playing with acoustic instruments. The band quickly spread the word amongst all their fans, and by the next morning, all the tickets were sold out. 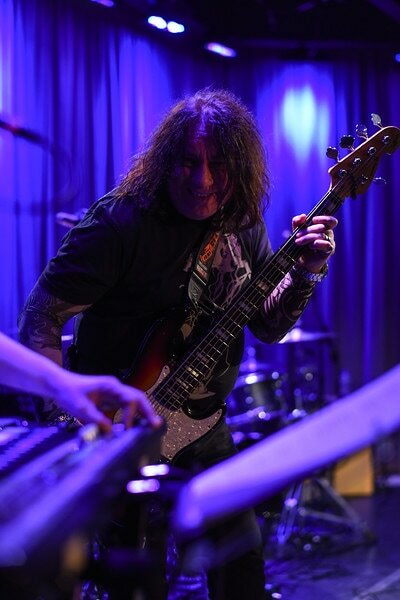 The theatre manager was shocked by the excited and rebellious attitude of the Melody Maker fans and realized this was a concert with electric rock musicians. He immediately called the Ministry of Culture (located across the street), and 30 minutes later, the government canceled the concert. That afternoon, 2,000 angry ticket buyers began arriving at the park adjacent to the theatre and started protesting the government's cancellation of the concert. The Melody Makers then showed up with their acoustic guitars and decided they would perform the concert acoustically on the front steps of the theatre. 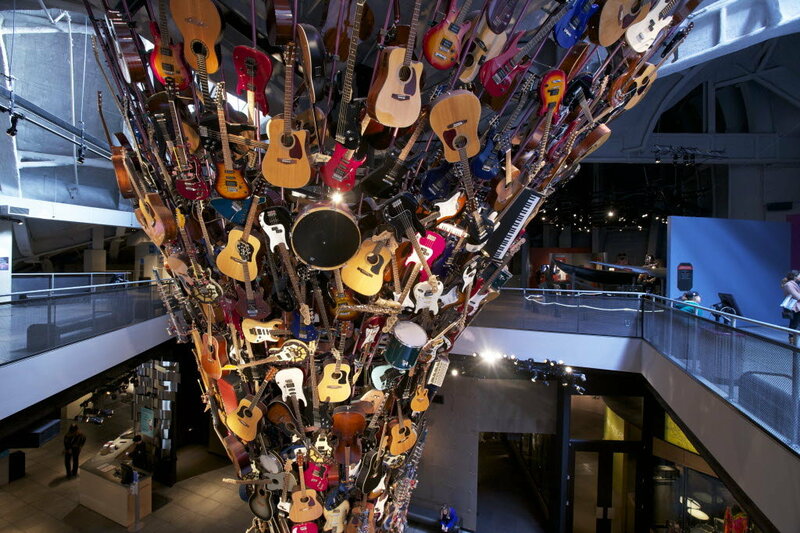 By the time the band starting playing and singing, the fans had made large placards with the wording "FREE THE GUITAR," and placed the posters high above the performing musicians. Six busloads of State Police pulled up outside the demonstration and began marching towards the theatre with the intent to stop the music and arrest the Melody Makers. However, all the protesters immediately locked their arms together so that the police could not reach their rock idols and stop the music of freedom. 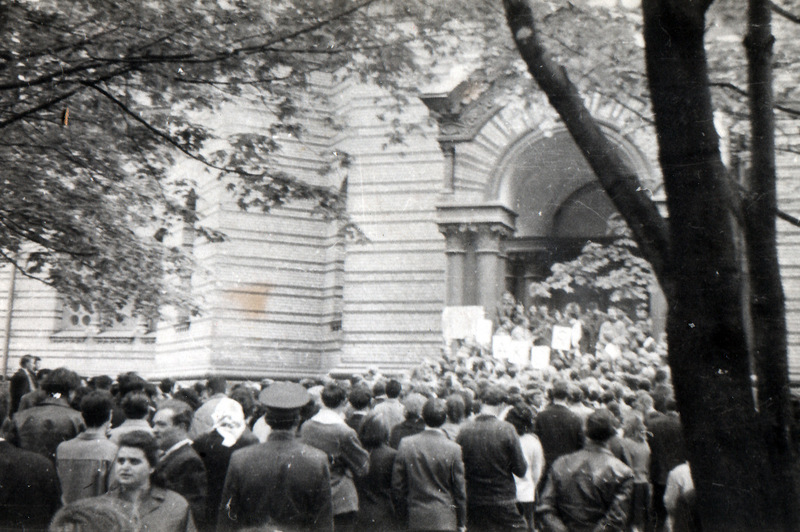 By all accounts, this was the first mass demonstration against the government in the history of the Soviet Union....and it was a protest about the freedom of music.....freedom for the electric guitar. The demonstrators who were arrested, were denied further education in Latvia. 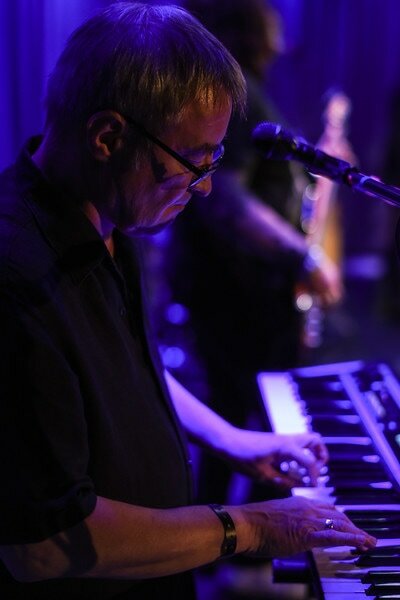 Pete Anderson left for Estonia and began playing in their most popular rock band. THE JUNIORS: Grisha Dimant (middle guitar player in the photo), formed his first band, The Juniors, in Riga in 1964, performing on homemade electric guitars and bass. They sang in English and performed Pop Rock music learned from American and British bootleg recordings. A protégé of Pete Anderson and Valery Saifudinov, Grisha was one of the organizers of the youth protest against the Soviet government in the 1966 Melody Makers “Free the Guitar” demonstration. 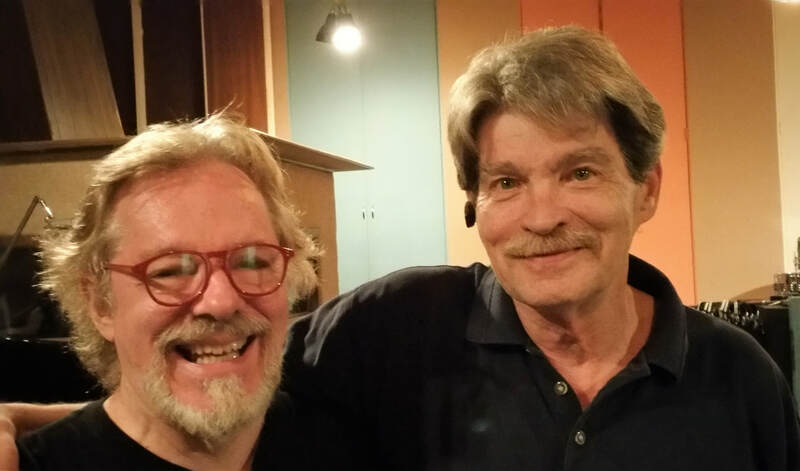 A very talented guitarist and singer, Grisha emigrated to America in the mid 1970s, and soon became a member of several important California recording groups, Moby Grape, and It’s A Beautiful Day. 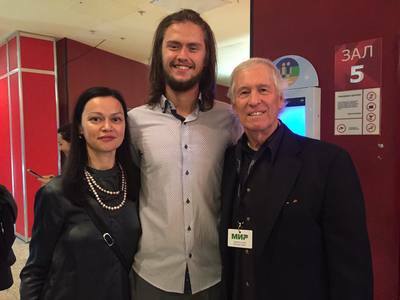 In addition to working as a musician and record producer, Grisha also acted in Hollywood as a comedic character actor on television and in film, including the film Money Pit, starring Tom Hanks. Grisha’s son, Leor, who was born in Riga, became a famous American hip hop DJ, rapper and producer of the groups House of Pain and Limp Bizkit, using the moniker DJ Lethal. Grisha filmed his interview for FREE TO ROCK in July of 2005; and sadly, later passed away after a long illness, in Los Angeles, on December 7, 2007. [Photo shows: Valery "Seitsky" Saifudinov on the left, and Pete Anderson on the right. Above them is a poster of revered American anti-establishment rocker, Frank Zappa]. 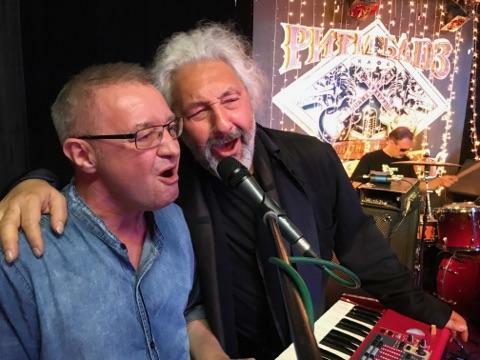 NATURAL PRODUCT (band): In 1970, Valery "Seitsky" Saifudinov (founder of the Revengers) and Pete Anderson (founder of the Melody Makers) joined forces to form a new band, NATURAL PRODUCT. 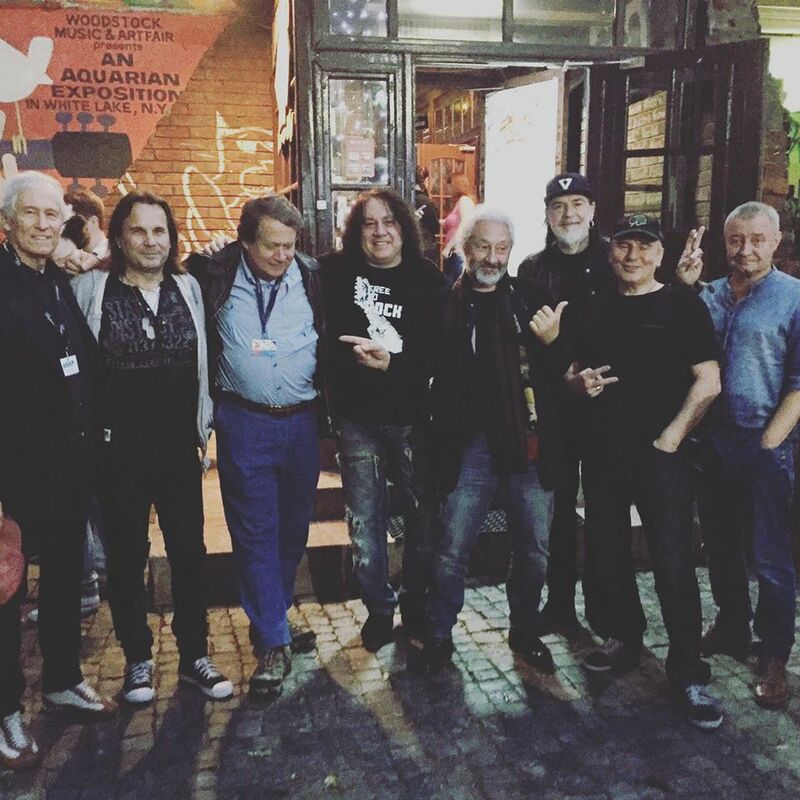 As the two famous pioneers of Latvian rock came together to form a super group, rock fans became very excited. 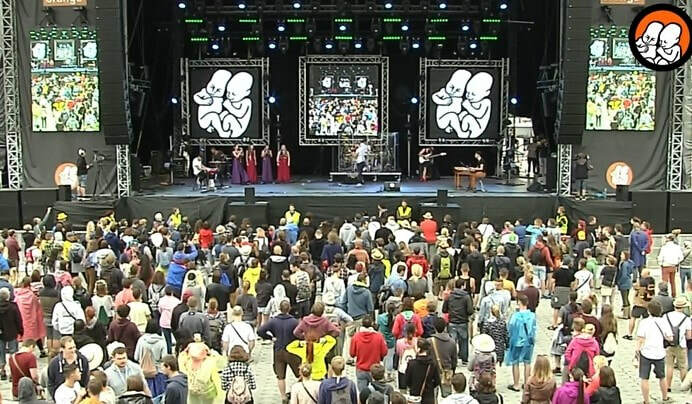 A concert was scheduled for the Technical College in Riga. 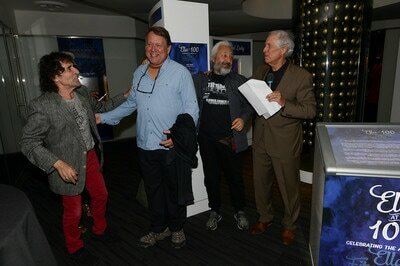 Prior to the concert, a press conference was held. The State Police raided the press conference, then herded close to 2,000 students like cattle into military trucks and transported them to the State Police Headquarters. 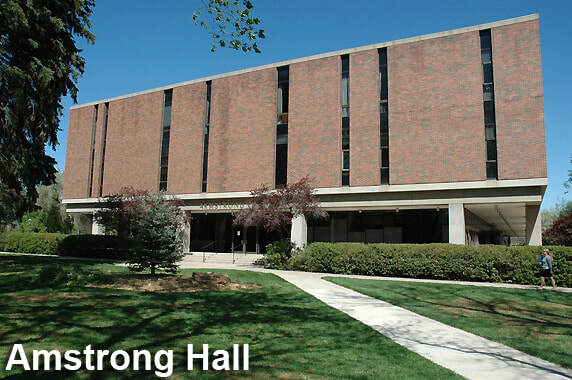 Every student questioned in the interrogation room was asked, "Do you know Pete & Setsky?" If they said yes, they would be arrested for their anti-socialist activities and denied further education. 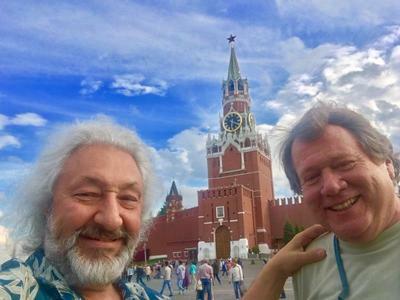 When Pete & Seitsky were interrogated, they were told that if they continued with their band or formed a new band, they would both be exiled to the East. 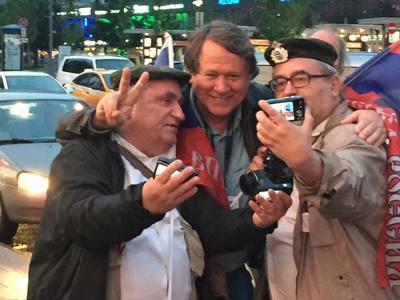 [Photo shows: (left to right): Yuri Valov, Yakov Zibinovich, Valery Saifudinov, and Sasha Lehrman]. In 1976, two Latvian rockers who had emigrated to America, joined the first Soviet rock band in the USA, Sasha & Yuri, based in San Francisco. Valery “Seitsky” Saifudinov (founder of the first Soviet rock band, Revengers) became their lead singer and Yakov Zibinovich their new drummer. 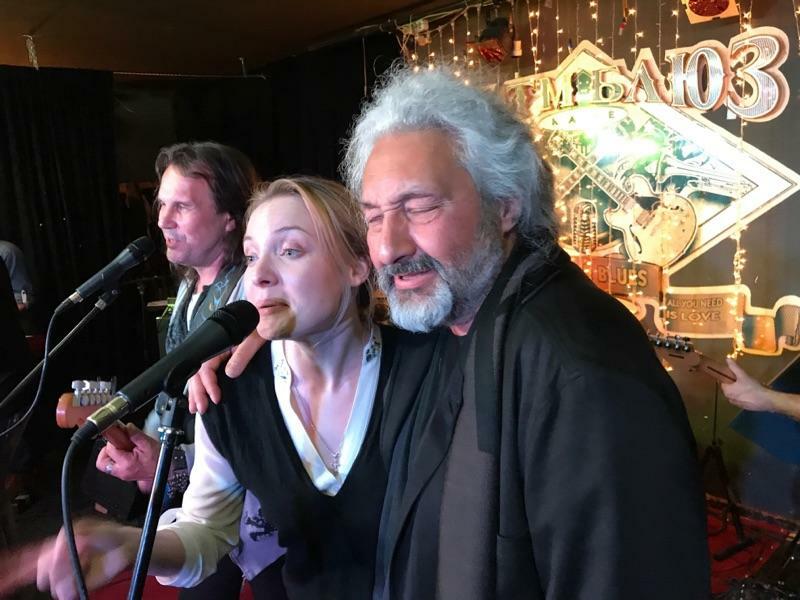 The two founding members, both from Moscow, were Yuri Valov (formerly of the popular Soviet government approved band, Blue Guitars) and Sasha Lehrman (formerly of the government band, Jolly Fellows). 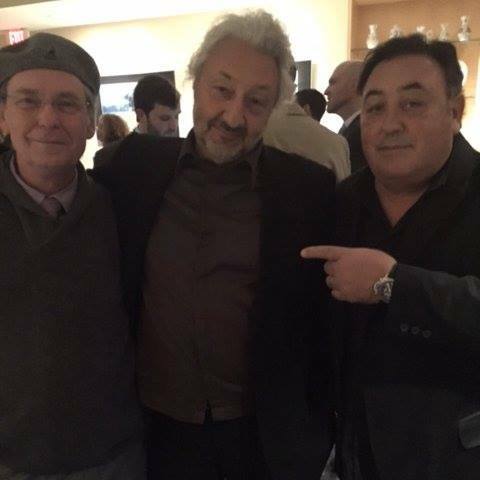 After Saifudinov and Zibinovich joined the band, the group’s popularity took off like a rocket in America. 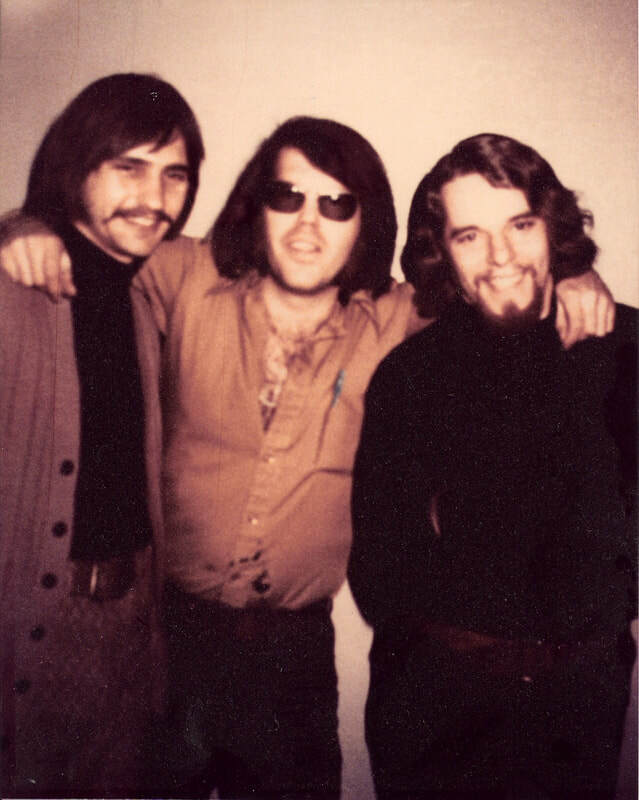 During that year, they toured with major American rock bands, such as Bob Seger, The Band, Eddie Money, Blue Oyster Cult, and Elvin Bishop; were interviewed on national television news programs; and co-starred on the national TV concert show “Midnight Special.” Sadly, due to a serious health condition of one of the members, the band broke up right before recording their first album. 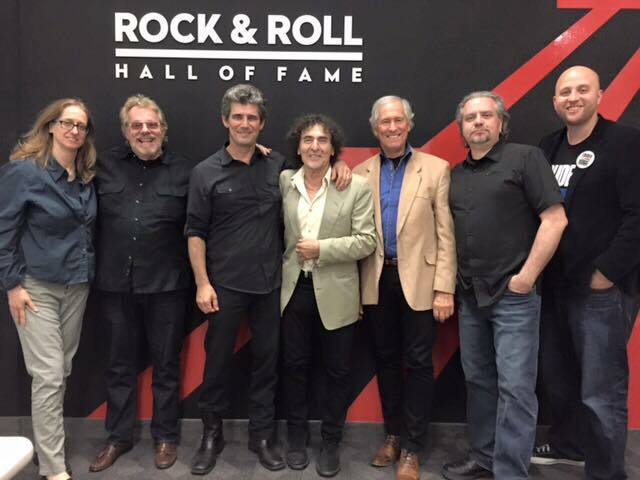 A feature article on the band was published in America’s most influential rock music magazine, Rolling Stone, with this photo. 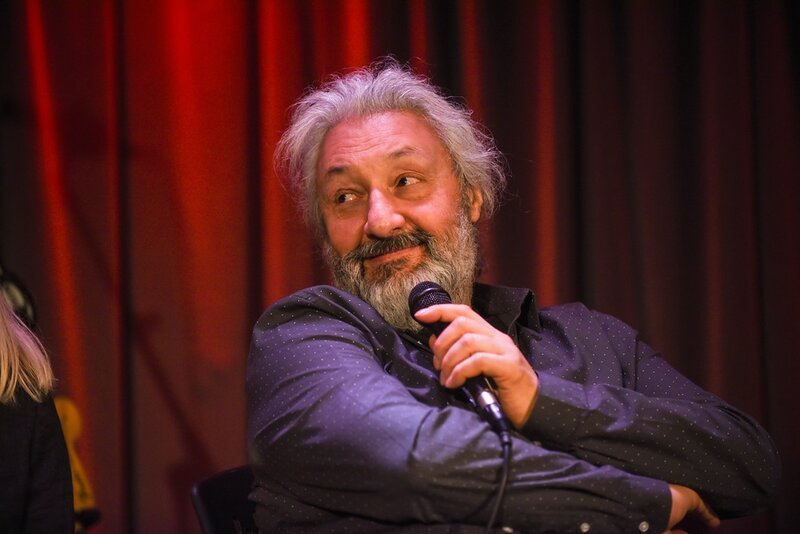 VALERY SAIFUDINOV’S FIRST U.S. RECORDING STUDIO: In 1978, Latvian rock pioneer Valery “Seitsky” Saifudinov opened his first recording studio in America. The formal name of this San Francisco studio was V Studios. 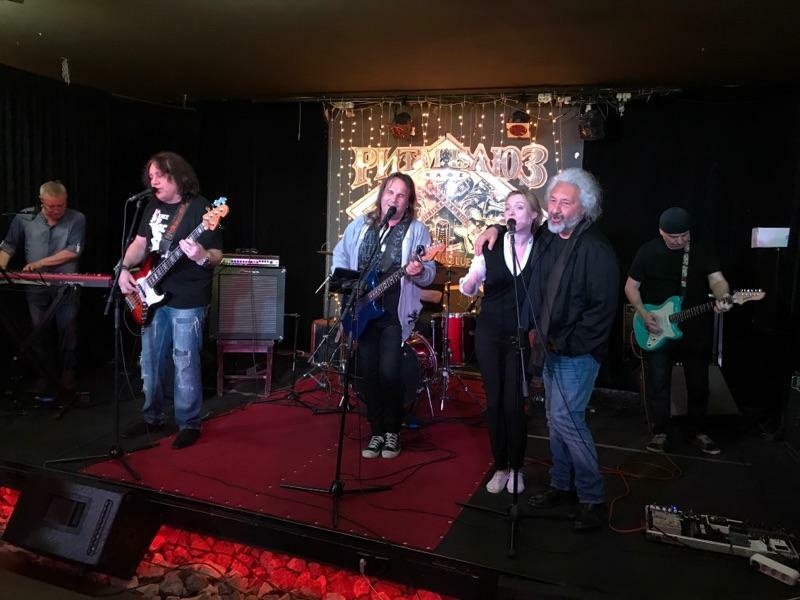 However, since his studio and rehearsal space was the second home for many ex-Soviet rock stars, it was commonly known in San Francisco as the Russian House Studio. Among the musicians who considered his space as their second home was Yuri Fokin, famed Moscow drummer who had been a member of both Soviet supergroups Tzveti and Mashina Vremeni. 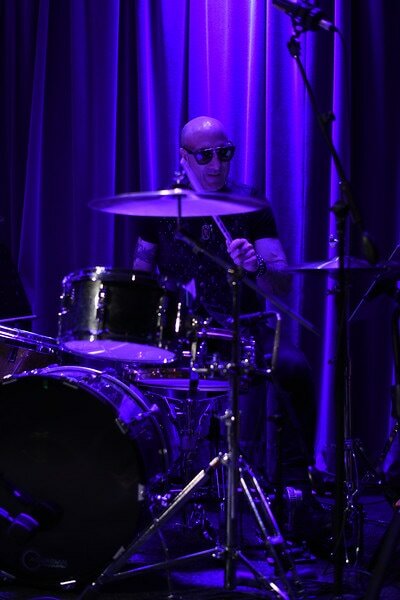 During this period, FREE TO ROCK producer, Nick Binkley became a friend to the studio, and his future band Nick Binkley & The Street Dogs was made up of these same ex-Soviet rock stars. 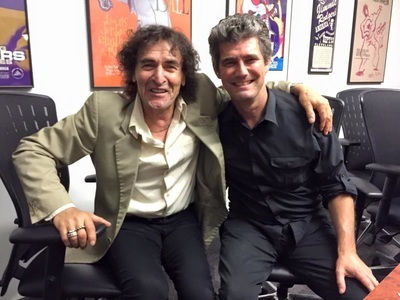 In 1983, Valery moved to San Diego and opened a new recording studio, Flight 19 Studios, with Nick Binkley, which he still operates today. While at Flight 19, Valery became the mentor to a young emerging rock star named Eddie Vedder; and in recent years, he has recorded the last two albums of his new rock band Elektrik Tank, for which he is the singer, composer, rhythm guitarist and producer. 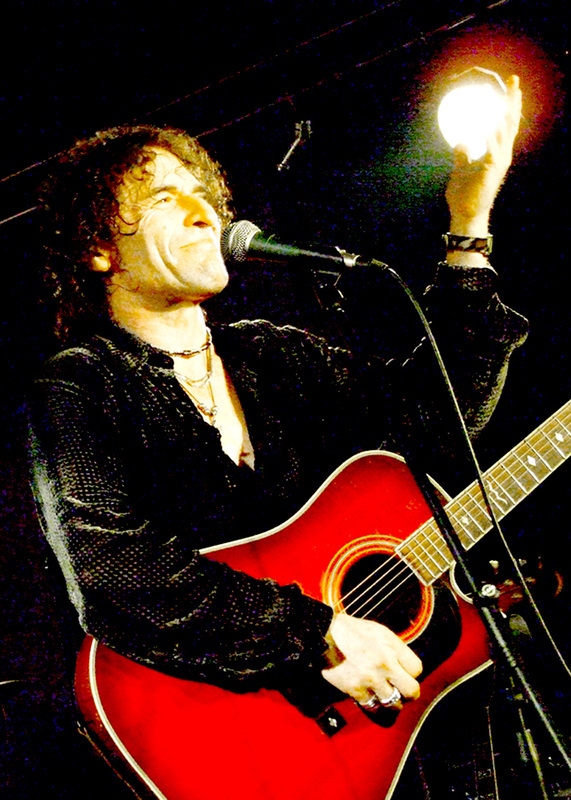 Valery is a featured interview subject and singer in the film FREE TO ROCK and a co-author of its Original Story. BALTICS WAY/HANDS ACROSS THE BALTICS: By the summer of 1989, the Kremlin was beginning to convulse and was experiencing immense difficulties in trying to hold its empire together. 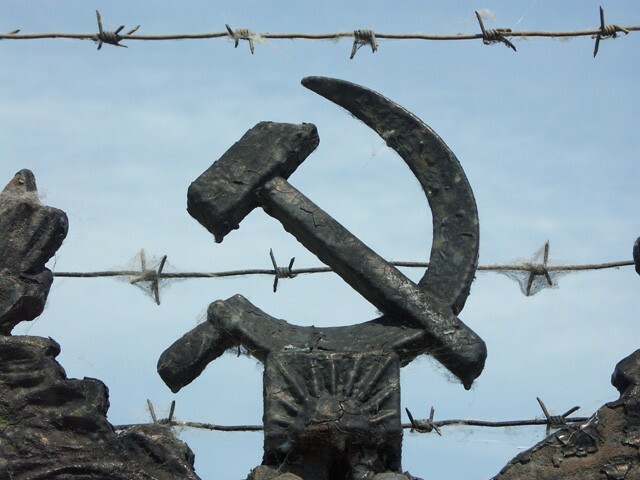 The occupied Baltic States and the Eastern Bloc nations were on a quest for freedom and independence from their Russian occupiers. 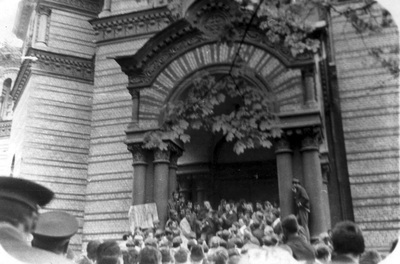 The peoples of Latvia, Estonia and Lithuania then agreed to make an unprecedented public demonstration against their Russian occupation on August 23rd, which marked the 50th Anniversary of the secret pact signed between the Kremlin and Nazi Germany, which allowed the Soviets to invade the Baltics and absorb them into the USSR. On that day, two million Baltics citizens joined hands in a chain link of brothers, sisters and cousins that began in Tallinn, Estonia, ran through Riga, and then down to Vilnius, Lithuania. It truly was a Singing Revolution, as loud speakers erected above the demonstrators proudly played a new song, “Baltics are Awakening,” written with verses in Latvian, Estonian and Lithuanian and sung by rock singers from each country. This event was the world’s largest unity chain of hands demonstration in history. 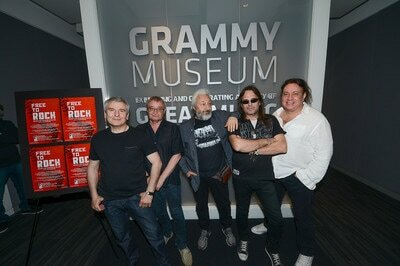 Film footage from this historic scene is displayed in FREE TO ROCK. [Ojars Kalnins, current Member of Parliament and Chairman of the Foreign Affairs Committee, is seen in the photo with Odetta (on the left) at a reception in Odetta's honor at the U.S. Embassy]. ODETTA and OJARS KALINS: Odetta, the iconic folk and blues singer and "Voice of the Civil Rights Movement," was a major influence on the careers of Bob Dylan, Janis Joplin, Joan Baez, Harry Belafonte, and Pete Anderson. She toured the Soviet Union in 1974, including concerts in Latvia and Lithuania where she befriended the outlawed rocker Pete Anderson, who traveled with her from Riga to Vilnius, while managing to avoid the KGB cars following them. In 2006, the producers of Free to Rock, Doug Yeager and Nick Binkley arranged to have Odetta return Latvia to co-host a National Human Rights Forum with Ambassador Ojars Kalnins, who, one year earlier, had become a trusted Advisor to the Free to Rock project and an interview subject in the film. While in Riga, Odetta also gave a historic concert at Maza Hall, participated in several cultural events sponsored by the U.S. Embassy, and she happily reunited with her old friend Pete Anderson. 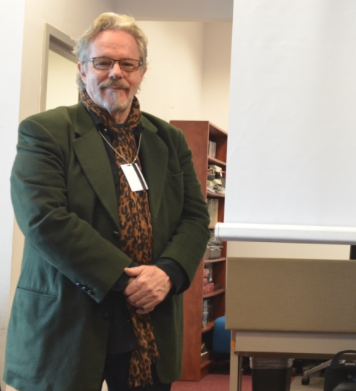 Ojars Kalnins and his wife Irma formed a lasting friendship with Odetta, and visited her in New York a few months prior to her passing in 2008. 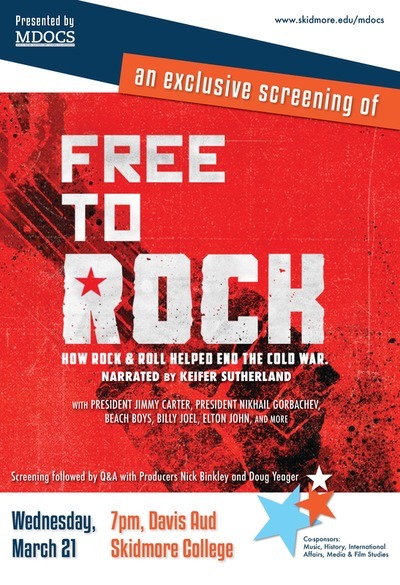 Free to Rock is a documentary film directed by 4-time Emmy winning filmmaker Jim Brown and narrated by Kiefer Sutherland. Rock & Roll spread like a virus across the Soviet Union despite Communist attempts to outlaw it. Thousands of underground bands and millions of young fans who yearned for Western freedoms helped fuel the nonviolent implosion of the Soviet regime. 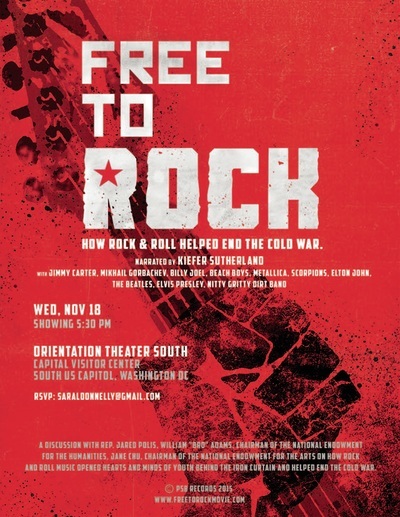 Free to Rock features Presidents, diplomats, spies and rockstars from the West and the Soviet Union who reveal how rock and roll music was a contributing factor in ending the Cold War.